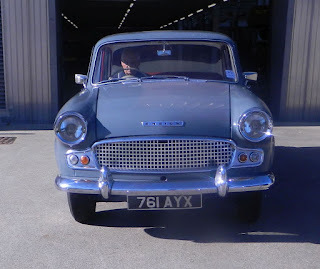 Built in 1960 at Canley by The Standard Motor Co. Ltd., our car is registration number 761 AYX, Chassis No. 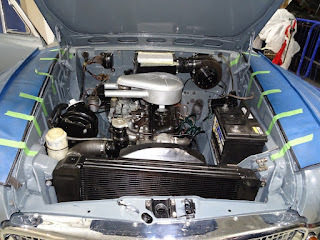 EN 16878-DL. 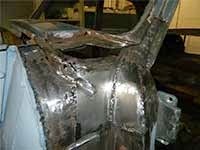 The price of the car when new was £850 including purchase tax. 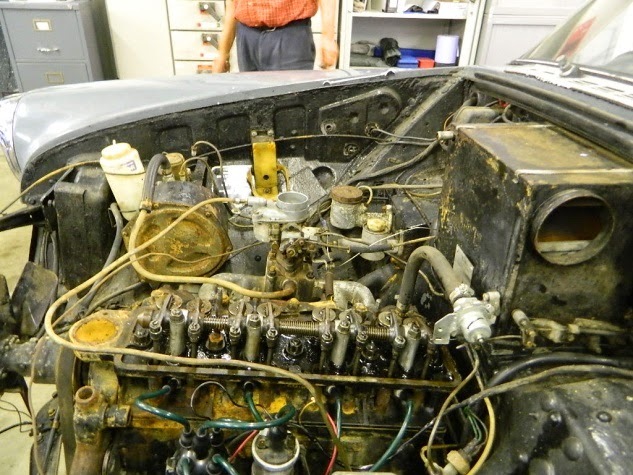 The car’s history is a bit vague, but it was donated to the collection in 1982 by its previous private owner. 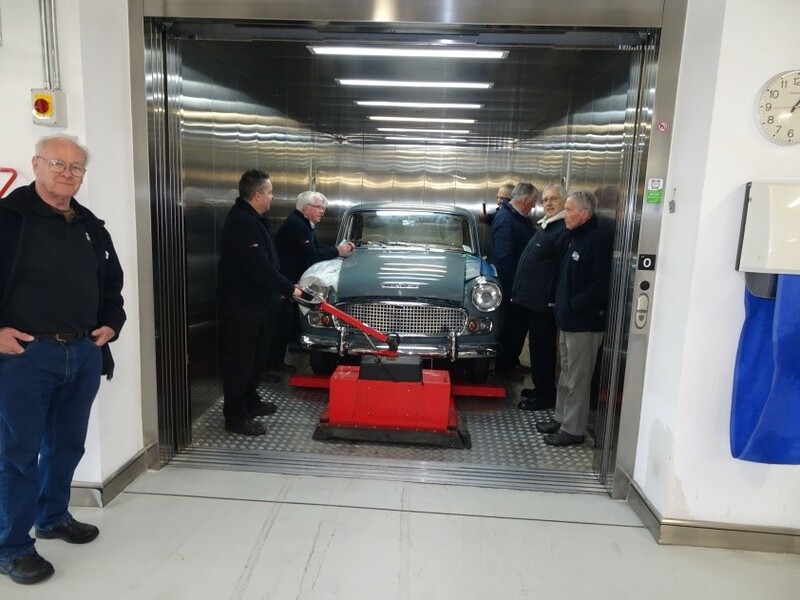 Since the Trust acquired the car it has remained in storage and has never been on display in the museum. 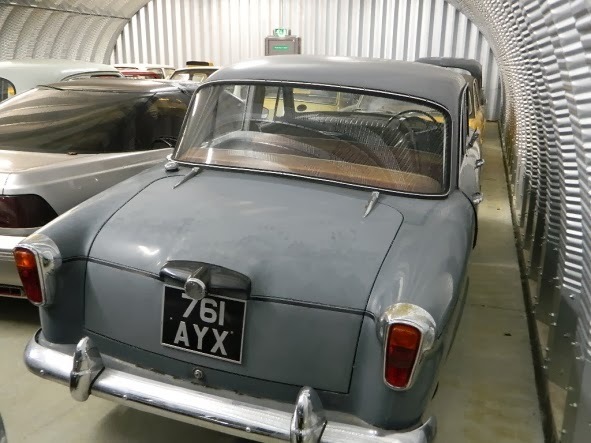 This situation is similar to a large number of vehicles that are owned and stored by the Trust and is one of the main reasons for the planned Museum Collections Centre. 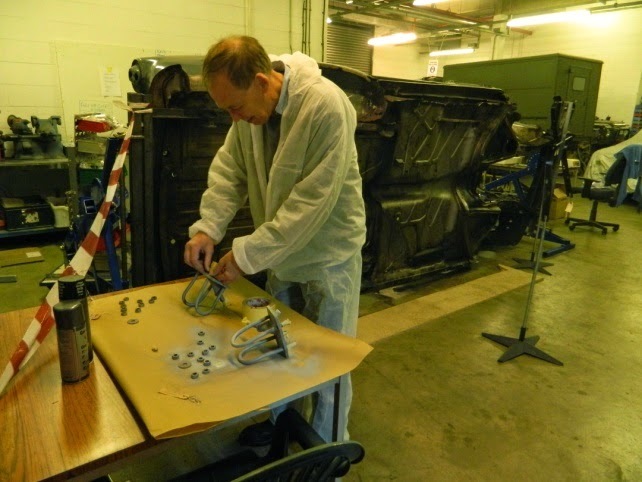 The Trust will then be able to display for public view all the vehicles, whatever their condition, in its large collection. 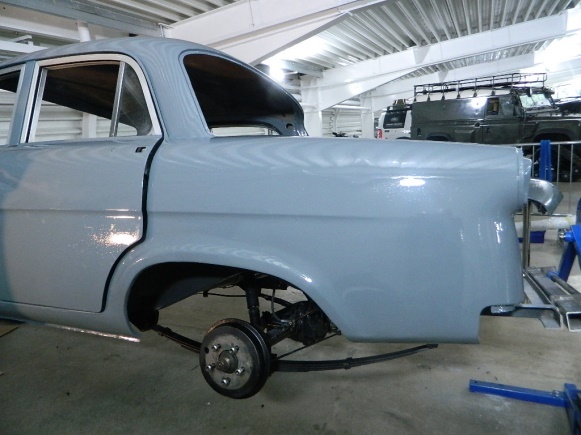 Anyway, our task is now to restore the vehicle to its original state with all components in full working order. 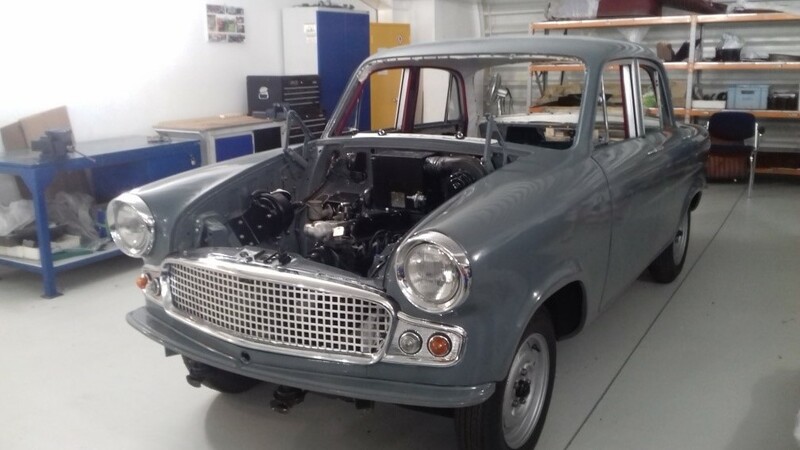 If this is achieved 761 AYX will then hopefully be passed as road legal so volunteers can drive it to events where the Heritage Motor Centre (HMC) has a presence. 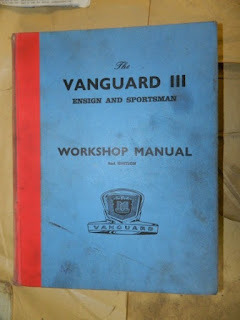 The experts amongst us quickly observed that some items of trim on the car are from the Vanguard model produced by Standard at the time. 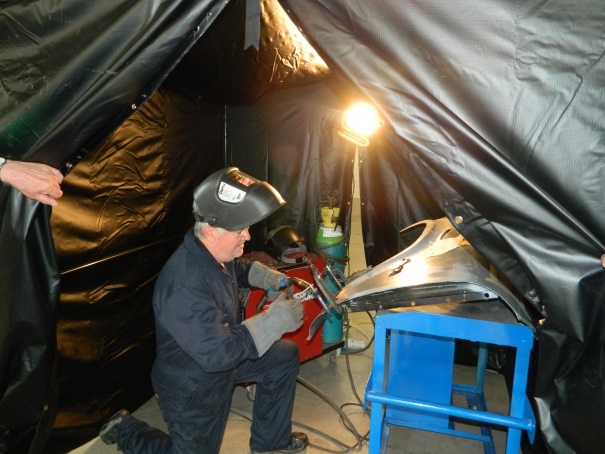 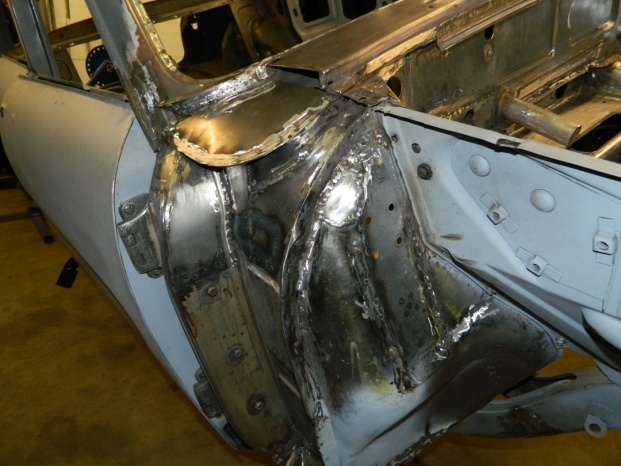 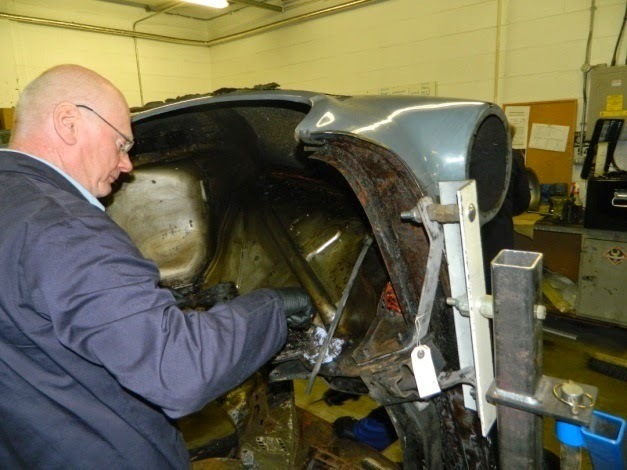 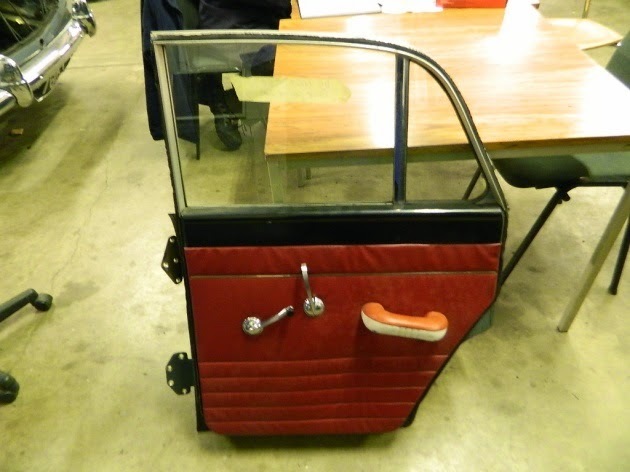 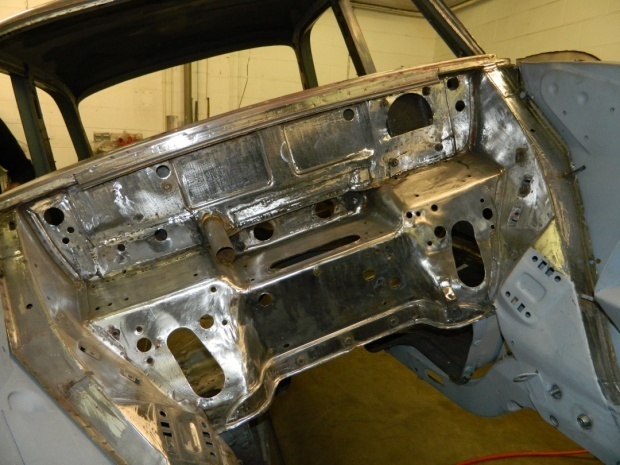 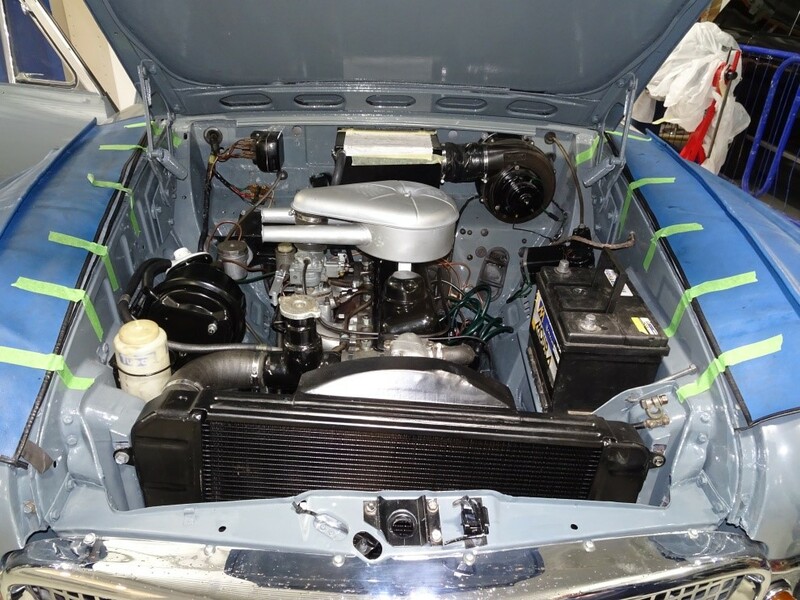 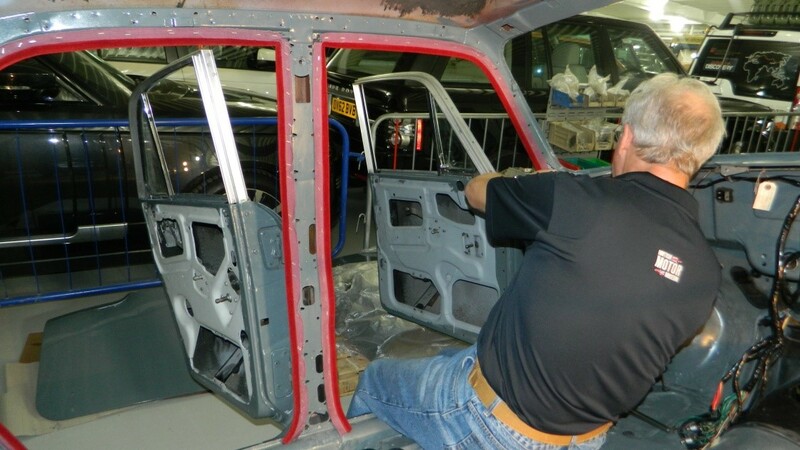 Our intention is to now source and fit all the correct items, restoring the vehicle to its original specification. 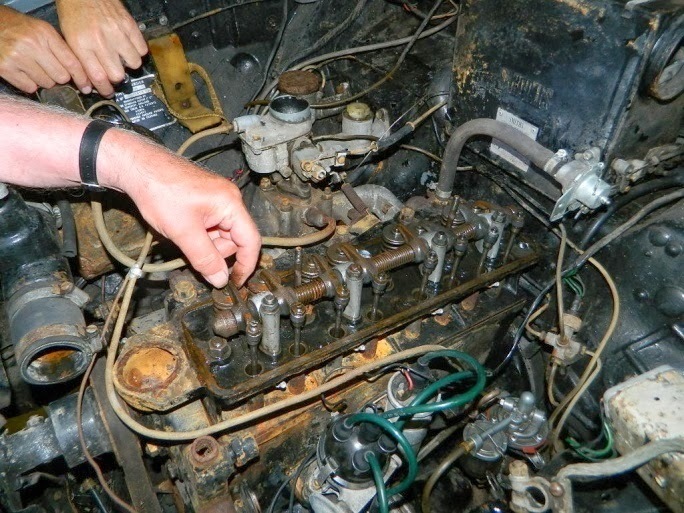 One of the first things everyone wanted to know was, would the engine start up and run? 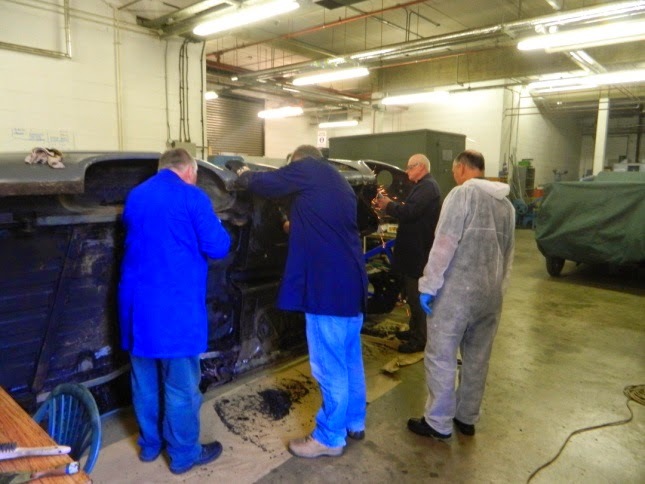 So, following a quick power wash, check over and the customary shout of “gentlemen start your engines”, we all waited. 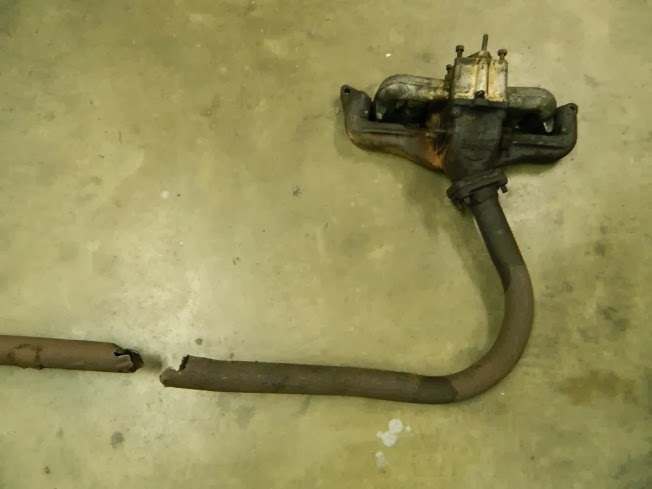 Alas, despite several efforts it just didn’t want to run. 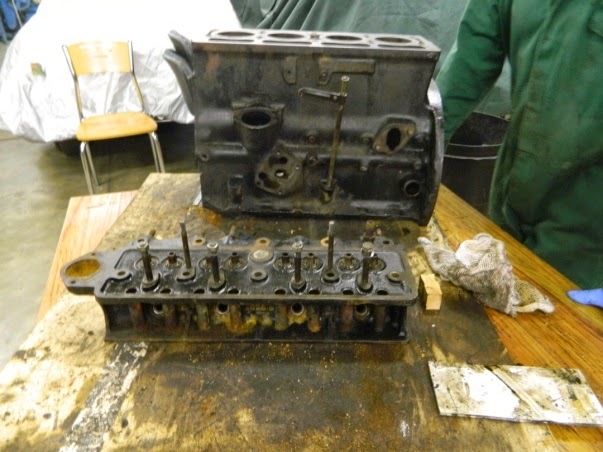 The reason was quickly identified following the removal of the cylinder head, when it was found that three exhaust valves were well and truly stuck. 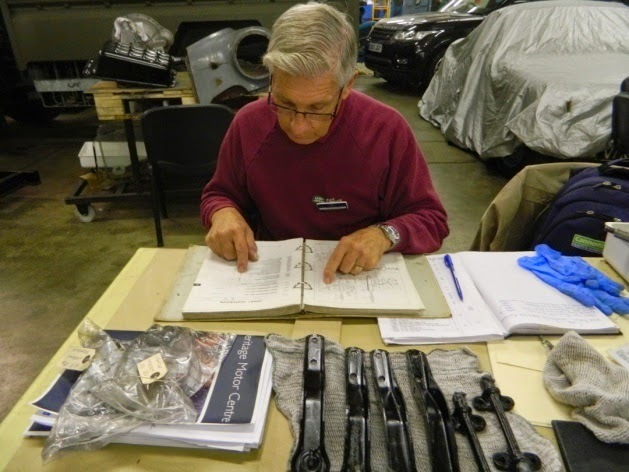 One of our first tasks as volunteers on being recruited in 2012 was to survey the condition of every vehicle in the HMC collection. The Ensign was amongst the first vehicles to be inspected and we had to rate the condition of the exterior, interior and engine bay area. 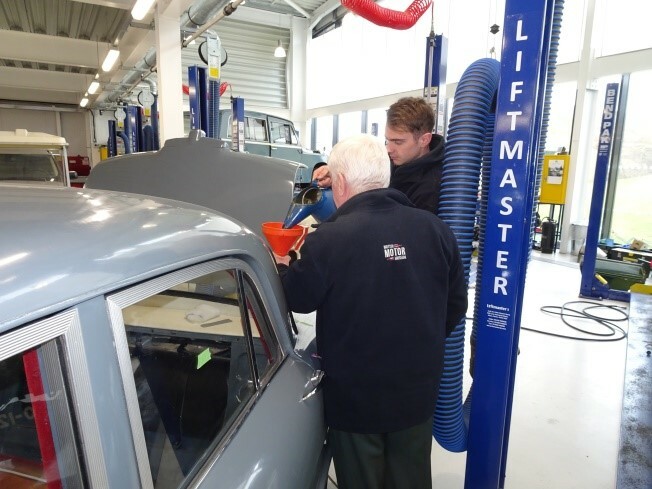 This was based on a 1 to 5 score system for each of the three areas, where 1 was Excellent and 5 was Poor – we then took an overall average to assess the general condition. The average score for the Ensign was 3.67, but as you’ll discover in forthcoming blogs, we may have been a bit generous. Standard Ensign - a closer inspection. My previous blog introduced our 1960 Standard Ensign, the volunteer’s first full restoration project. I should perhaps mention now that this project actually started at the end of July last year, so I have a bank of six months’ photography and progress on which to reflect. 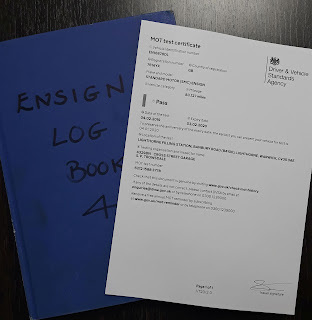 In the first blog I briefly described our vehicle survey scoring system, mentioning the Ensign scored 3.67 out of 5, where 5 is Poor. The reasoning behind this was to give the museum’s Curator a rough idea of the state of all the vehicles in the Trust’s collection. 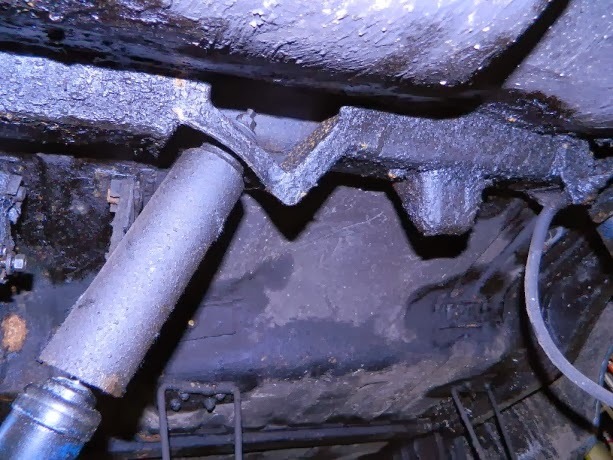 However, our inspection of the underside of all vehicles was very much limited as we had to rely on the slimmest among us crawling underneath with a torch. Putting the Ensign on a proper ramp and having a really close inspection and poke with a screwdriver quickly revealed that we might have a real challenge on our hands. 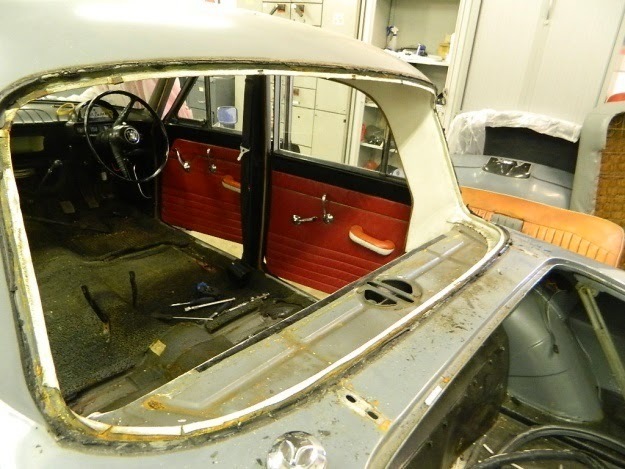 The dreaded four letter word feared by all restorers - RUST – was clearly widespread and in some places quite severe. 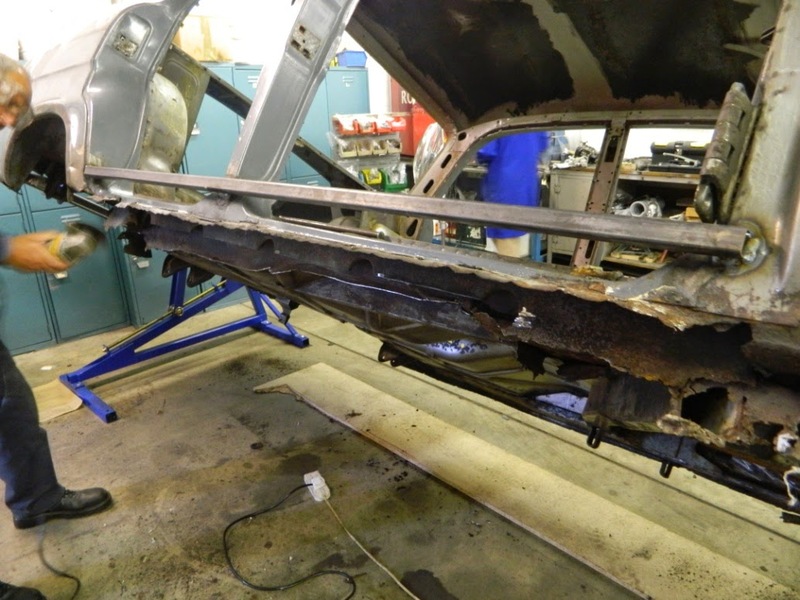 It also became apparent that a series of amateur repair welds had been carried out on the underside of the chassis. 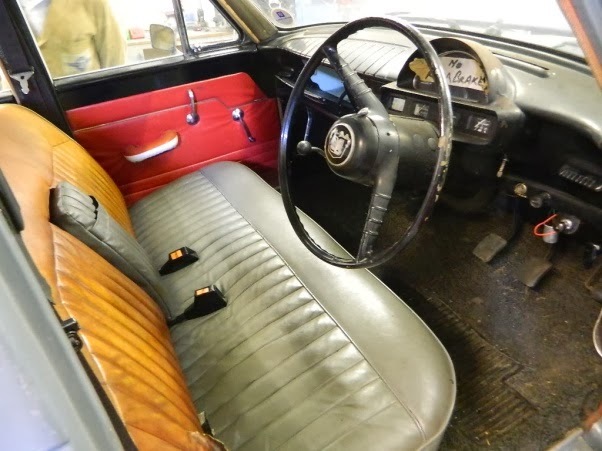 This would have been done during the 22 year period between 1960 and 1982 most of which was now covered in a generous covering of black sealant. 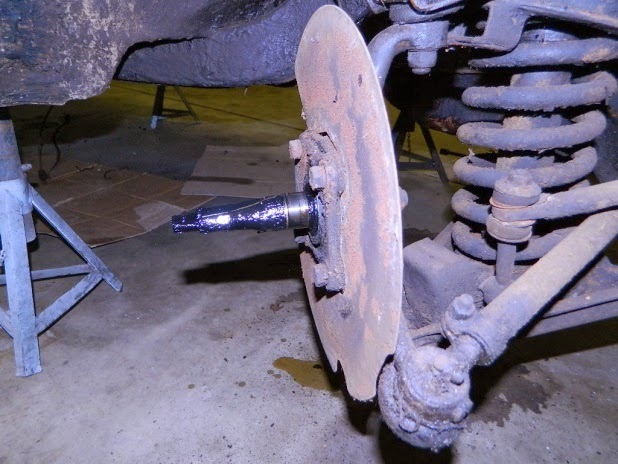 We shouldn't have been that surprised though. 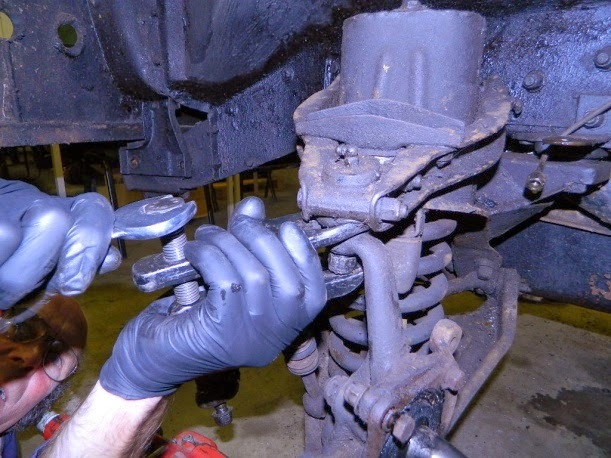 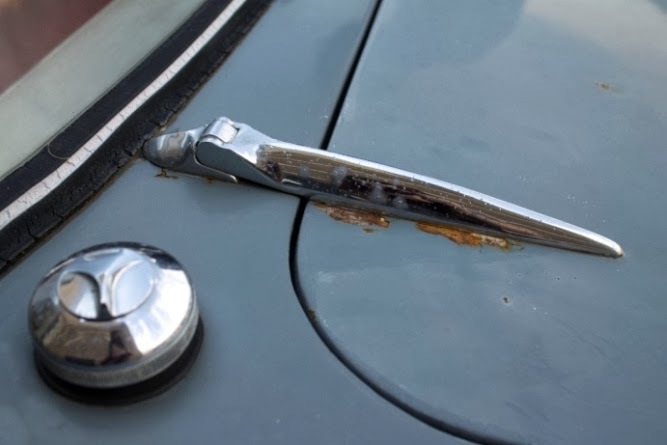 Vehicles of this age and design are always prone to rust and corrosion if not treated with kid gloves during their lifetime. 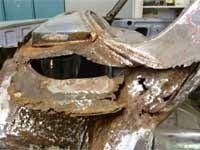 The tell tale signs were all there to see, rust around hinges, headlamp surrounds, floorpan joints, wheel arches, bottom sills, engine bay – in fact all the usual places. 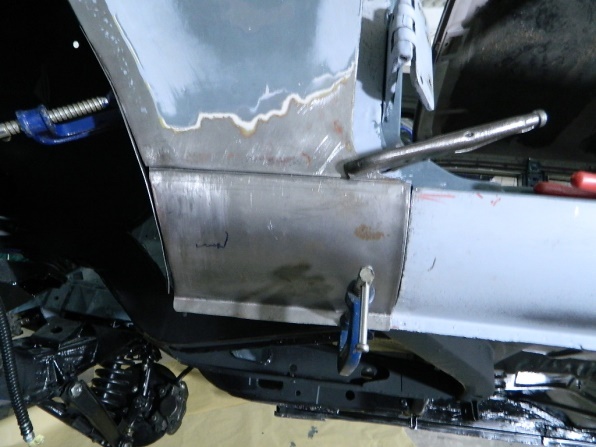 So, as you may have guessed, it was already obvious at this early stage that Ensign 761 AYX was in a fairly sorry state. 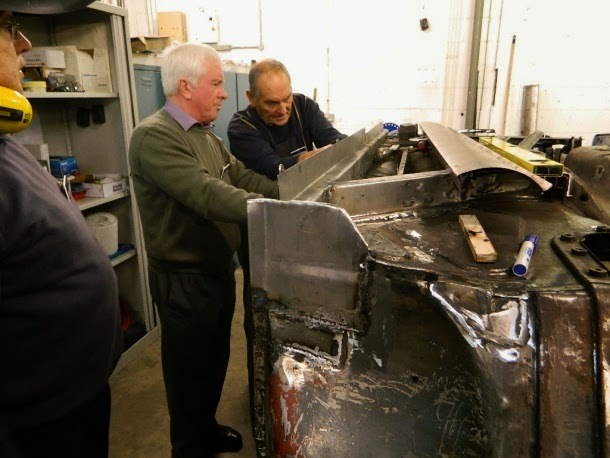 Ahead of us we were clearly going to be faced with many hours of hard work and labour, some pondering and debating, but hopefully in the end a rewarding experience. General dismantling of all the trim items now followed. 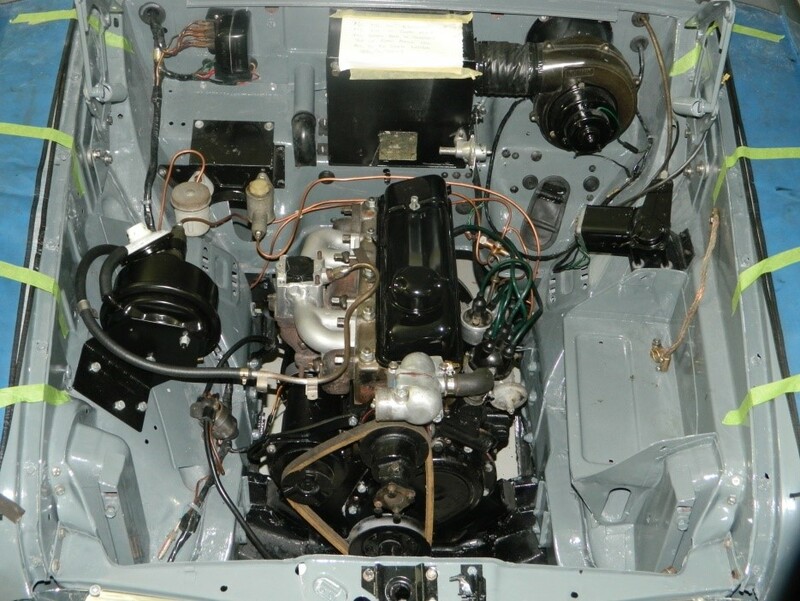 As was touched upon earlier, our Ensign did on closer inspection have a number of foreign parts fitted from other Standard models. 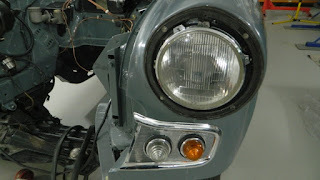 These included a chrome headlamp and tail lamp rims, twin front side and flasher lamps on chrome surrounds, a reverse lamp and a lidded glove box. In addition some optional equipment was fitted, like front disc brakes and servo and front and rear overriders. 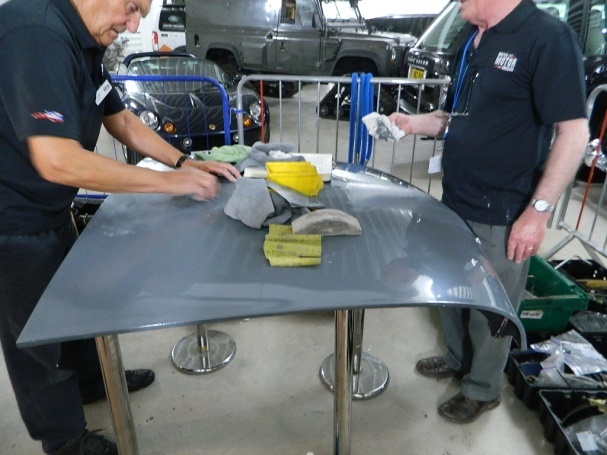 With different teams, usually comprising three or four people per day, working on the car every week it was particularly important that such a large project was properly coordinated. 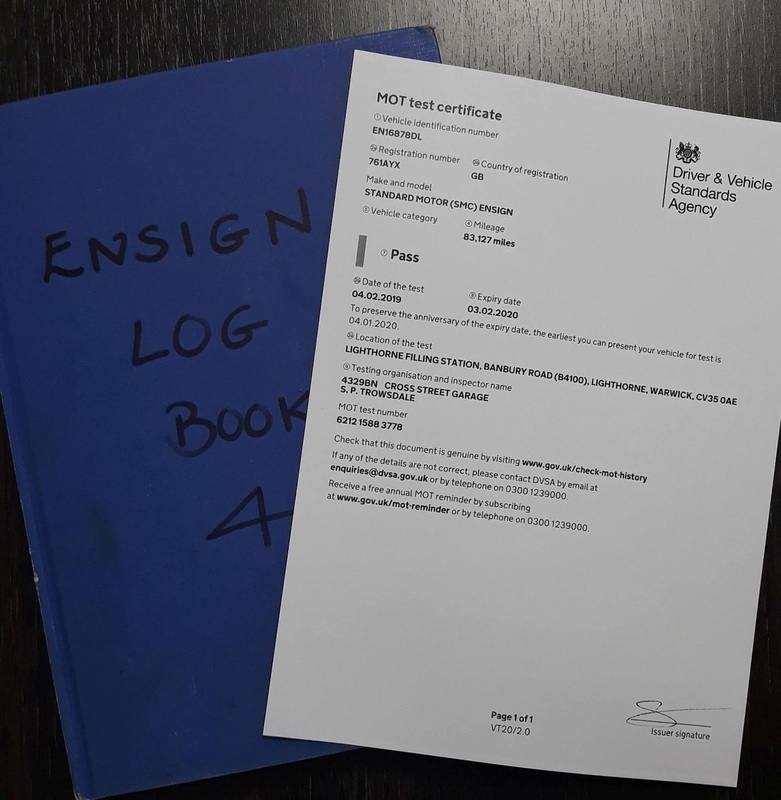 This was achieved by the completion of a daily log, recording the work carried out, together with an itemised list of any outstanding tasks. 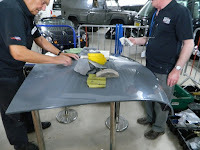 The log would also contain specific requests or advice relating to work in progress as well as suggestions on what area of the car should be tackled next. 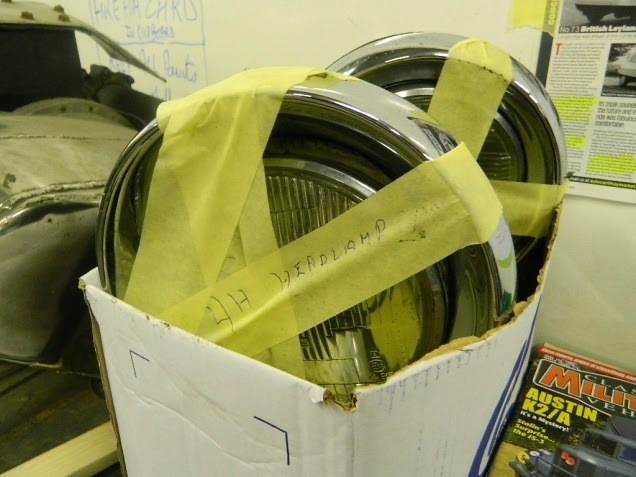 All this information was backed up with detailed photographs and the labelling and storage of all parts as they were removed from the car. 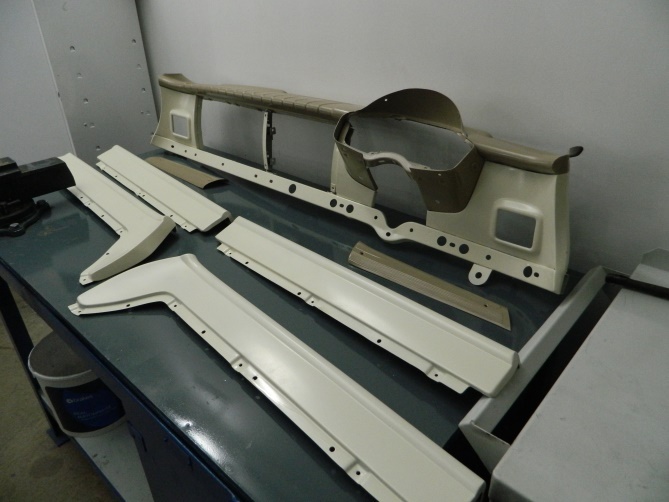 Whilst nearly all the parts removed were in a fairly reasonable condition for a vehicle of this age, the same could not be said of the body shell. 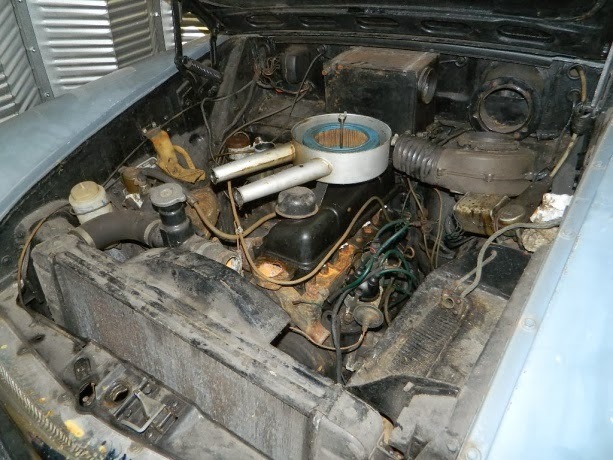 The next Ensign blog will reveal its full condition and the challenge that now lies ahead. 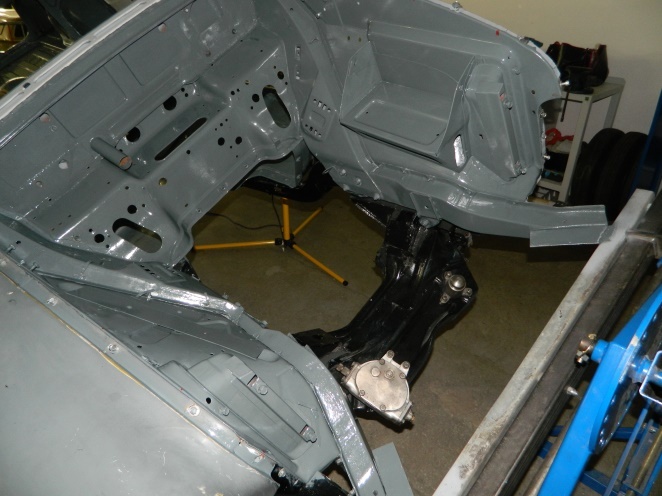 The removal of all parts, leaving just the bare body shell, took around four weeks to complete. 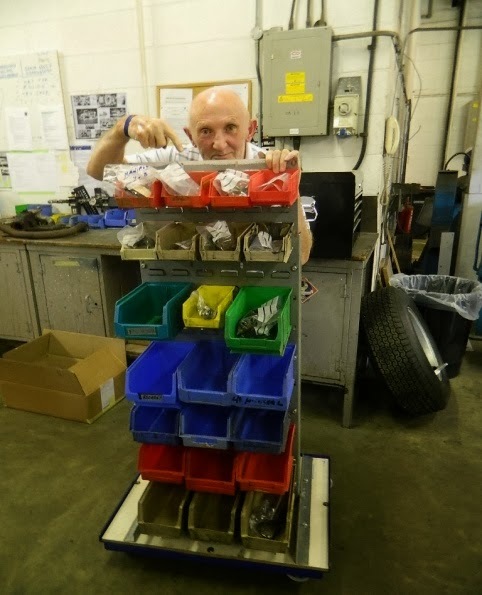 This also involved photographing all components, labelling and storing the smaller items where appropriate and inspecting the more major items for any serious damage or wear. Generally speaking, for a car of this age, we found nothing alarming and certainly nothing we felt we couldn't repair or restore. 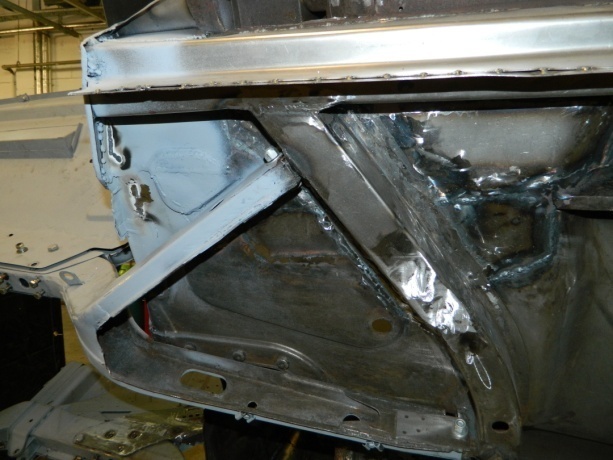 However, we all knew from just a casual inspection and a poke with a screwdriver that the body shell/chassis was not in the best of health. 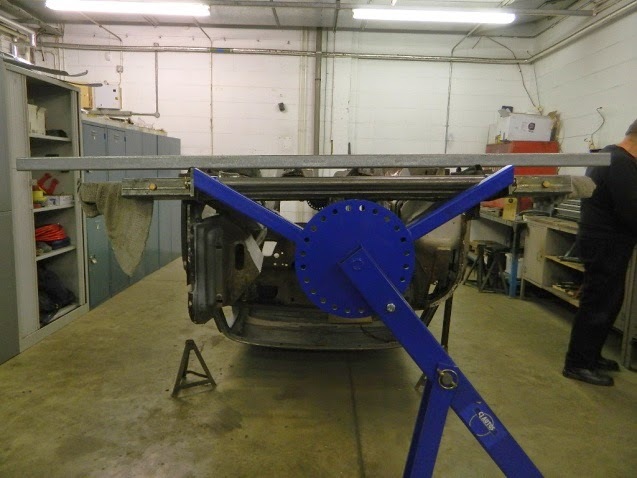 As cleaning and repairing the shell was clearly going to be a major task we were fortunate that the museum was able to provide us with a new Chassis Tilter. 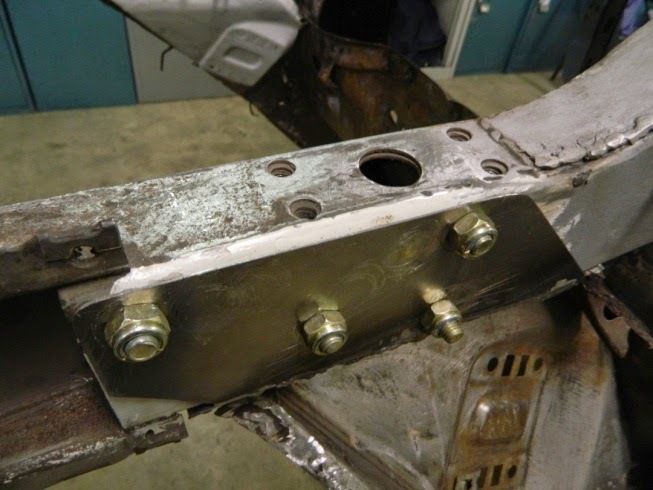 Once some additional brackets were made up and fixed to the chassis it was bolted to the Tilter front and rear. 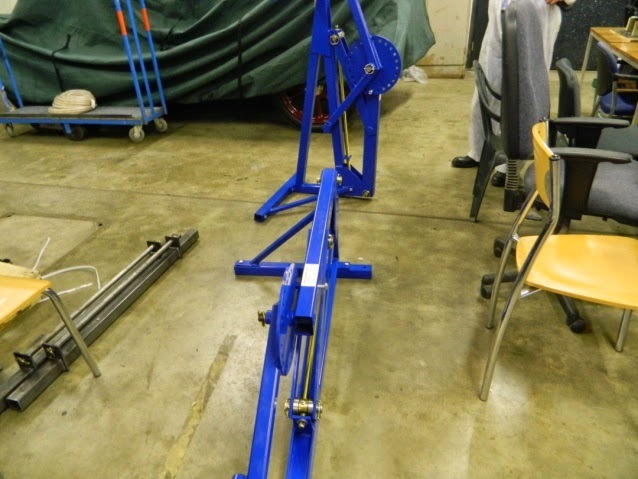 The tilt/roll mechanism of this excellent, but simple, piece of kit was to make our task a lot easier. 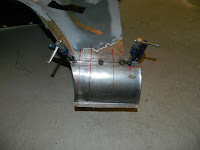 So, with the shell now stripped of parts and secure in the new tilter, the great scrape could now commence. The whole underside of the shell was covered in a lovely thick layer of black underseal, or gunge as it was often referred to. 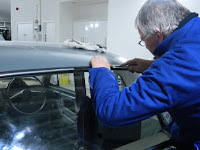 A heat gun and scraper was the best means of attack and many hours were spent completing this warm, but sticky and sometimes smelly task. As the underseal was removed we quickly discovered far more panel rot and previous welding repairs than we initially expected. 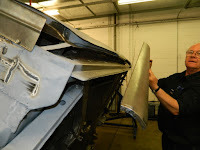 Originally we thought we could probably leave the underseal in the wheel arches, but we quickly realised that this was not now a sensible option. The more underseal we removed the more we realised that to repair the shell was going to be a a fairly major operation. 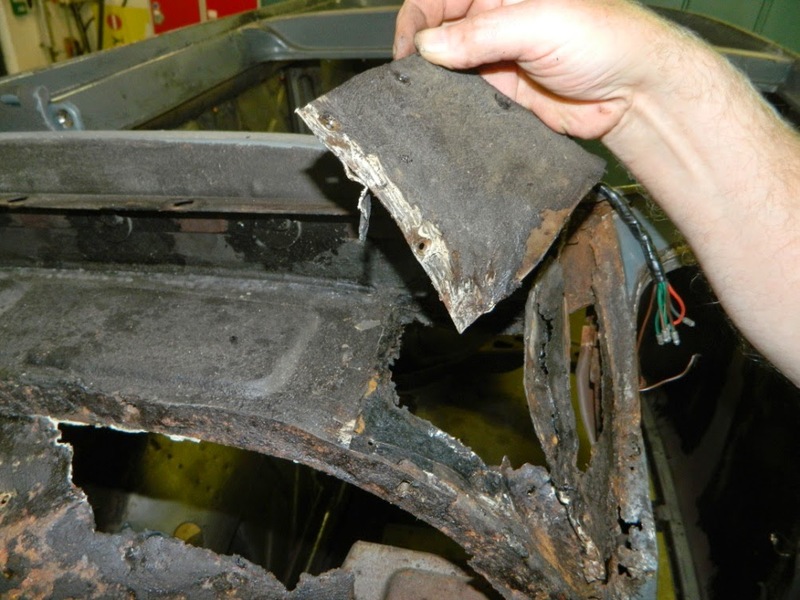 Rust, corrosion and bad repairs were everywhere, particularly in the important structual areas. 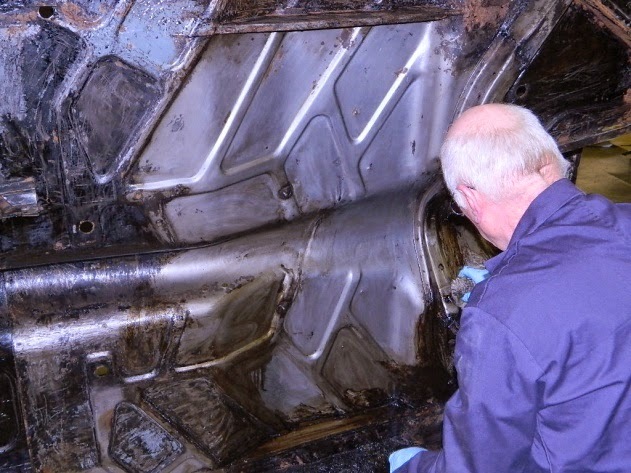 Next time we’ll show you pictures of just what we discovered underneath the gunge. 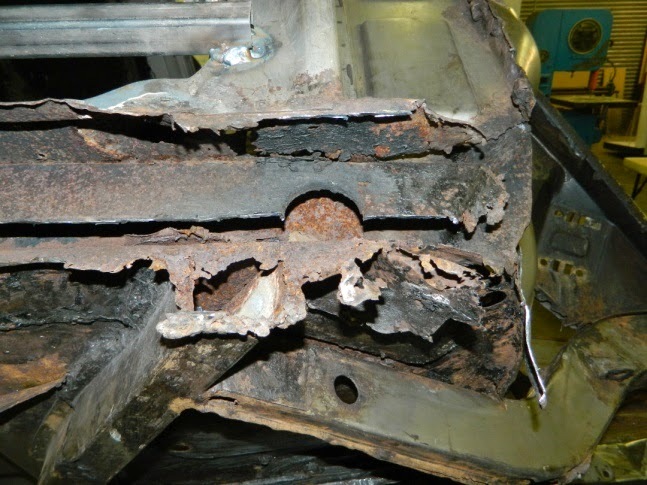 This photo shows the completely rusted sill with the worst areas of rust already removed. 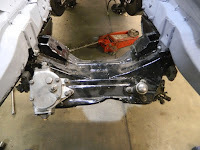 Also visible is one of the two strengthening bars needed to keep the chassis rigid. 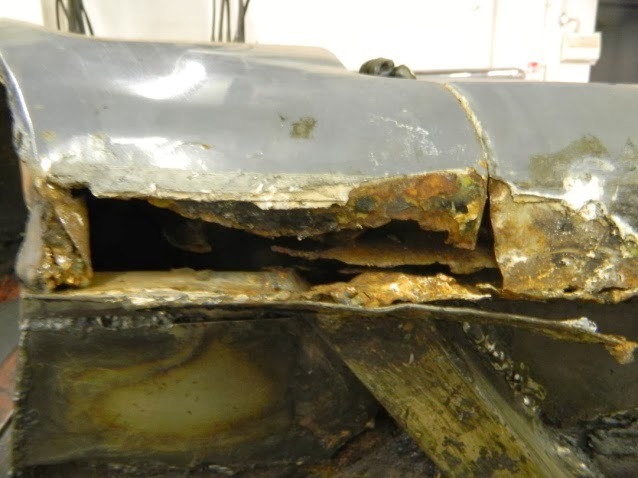 These photos show more detail of the rust in front of the rear wheel arch area and around the leaf spring support, as well as the severe rust and damage to the front underneath of the car around where the chassis rails meet. 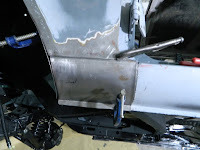 This is the condition of one of the main chassis rails which support the engine. 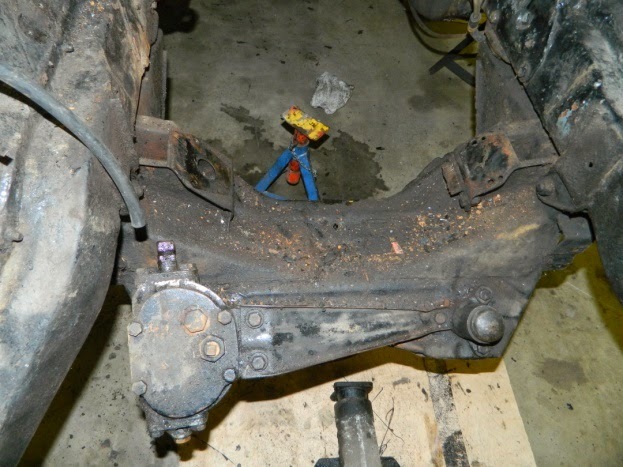 As you can see it’s not a pretty sight and the other side was in a similar state. Rust was not only confined to under the chassis as can be seen here. 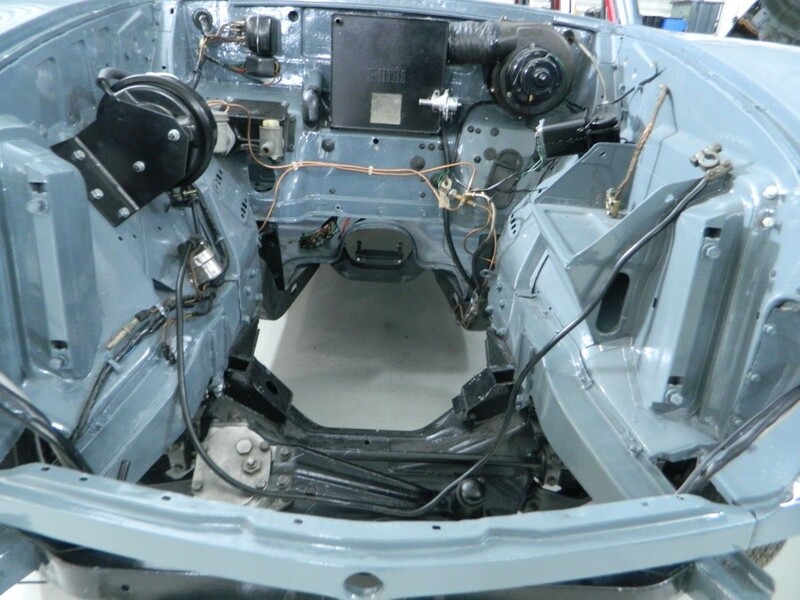 In this photo the chassis is on its side and the bottom of the front windscreen pillar can just be seen where the wire loom hangs. 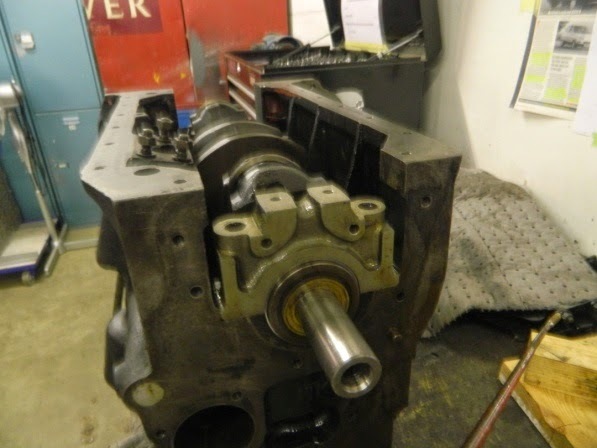 Next time – Danger men at work. 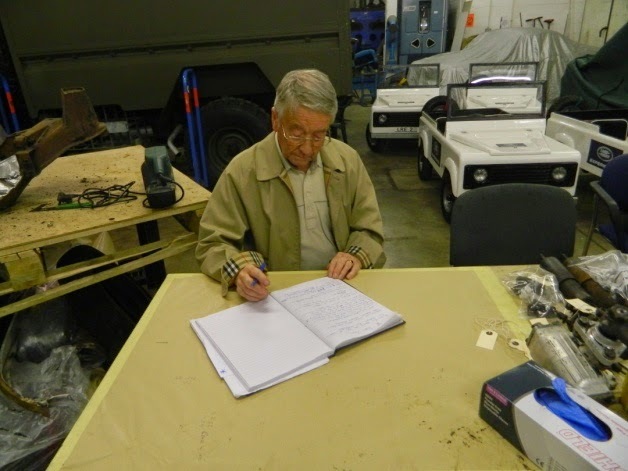 Currently we have around twenty volunteers actively involved in restoring the Ensign, so it’s essential that an up-to-date log is kept. The Ensign’s manual is also never far away. 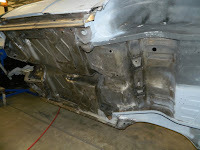 Scraping off all the underseal and then identifying and cutting out all the rust was a long job. 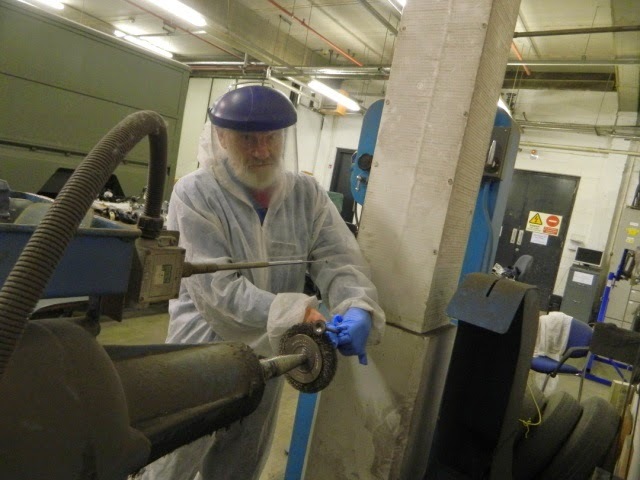 As volunteers, we must comply with all the relevant Health & Safety legislation. 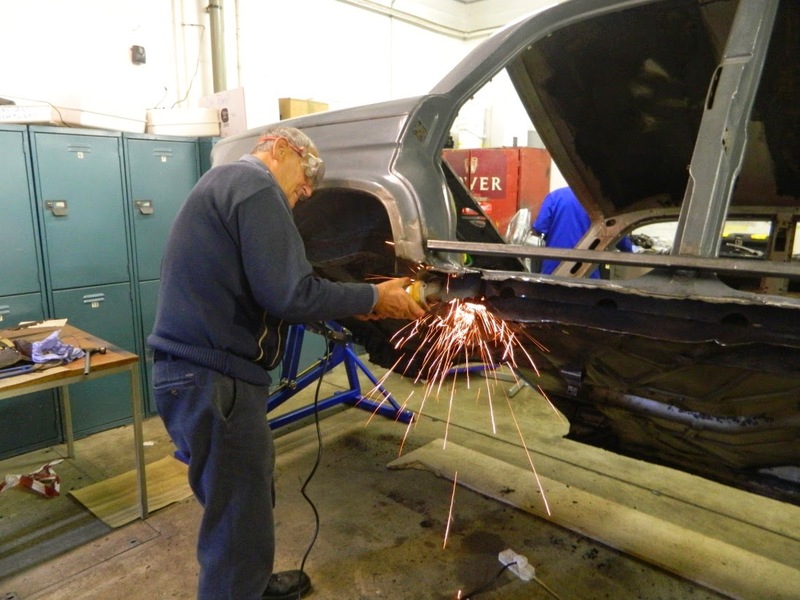 So when the sparks fly, like here when we are cutting out the rust, a Hot Work Permit is required, plus the wearing of safety glasses and footwear. 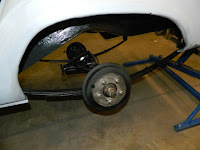 Back axle spring support U-bolts come in for some attention, whilst the workshop’s bead blaster has been a very useful piece of equipment at our disposal. 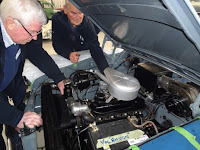 Our first look inside the engine and as you can see even Father Christmas is a volunteer. 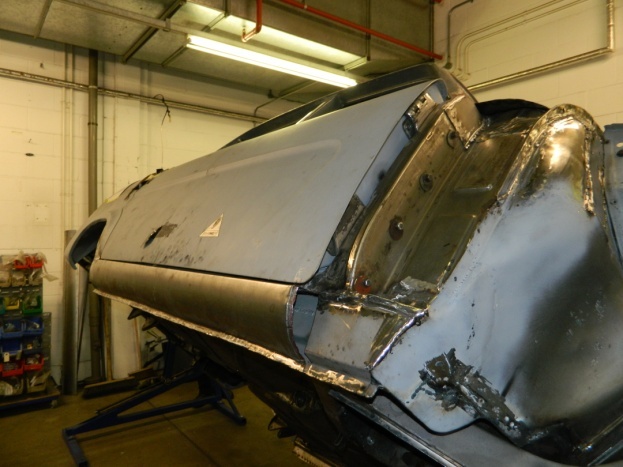 Next time we will look at our biggest challenge yet – repairing the Ensign’s bodyshell. 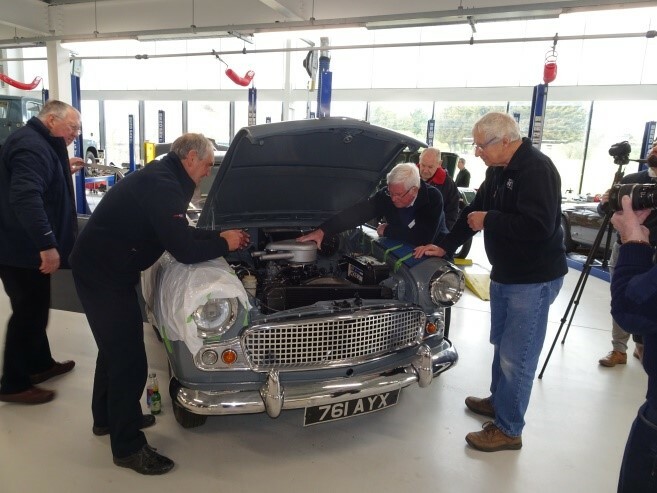 Whilst the majority of the volunteers had restored or fettled with their own classic cars, no one had faced anything like the challenge we were about to undertake. 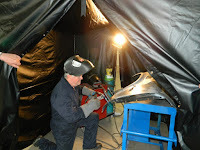 Only a couple had any real experience of welding and then only on a small scale. Added to this, it was clear that we were going to have to cut, shape and fabricate many new sections of now missing body work. 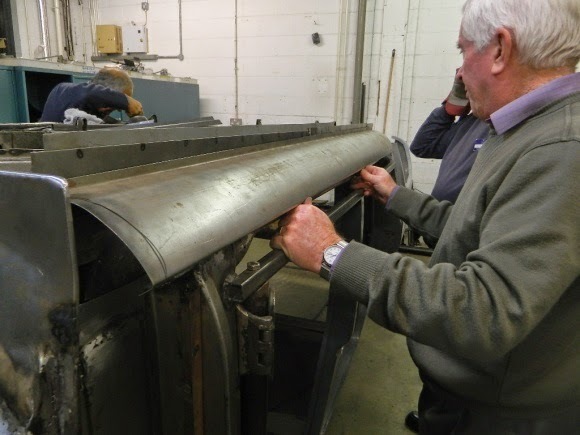 We were fortunate to be able to source two new sills, but at the time of writing that was all. 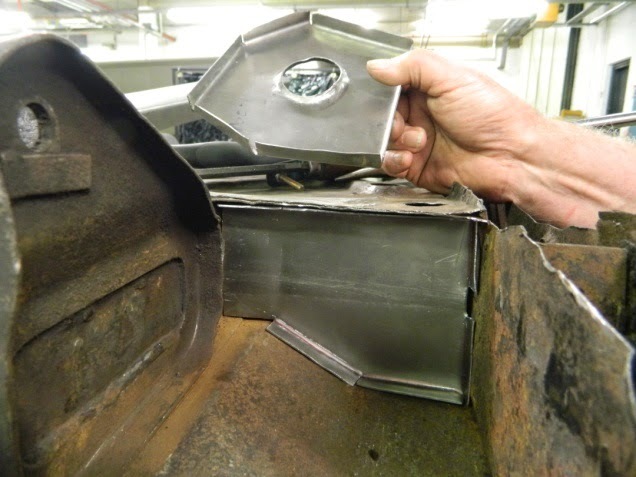 Welding was definitetly a case of learn as you go for most volunteers, whilst the acquisition of a pre-fabricated sill, shown in the second photo, made one job a bit easier. 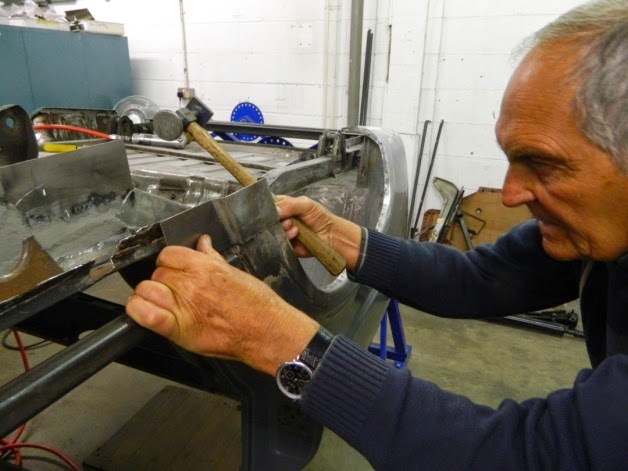 Initially at this stage of the project things started to slow down considerably as the enormity of the work ahead started to become apparent. 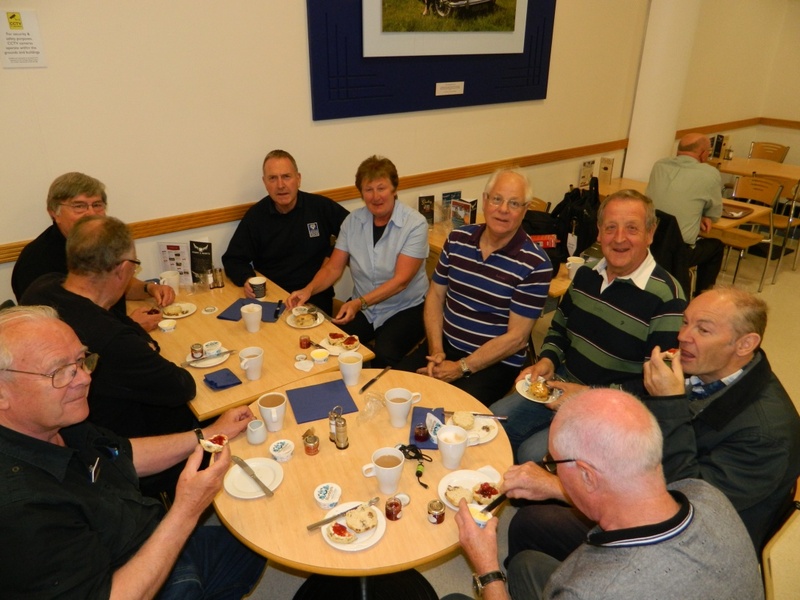 However, following a meeting of all the volunteers, a coordinated plan was put in place, team leaders were briefed and our collective energy was restored. 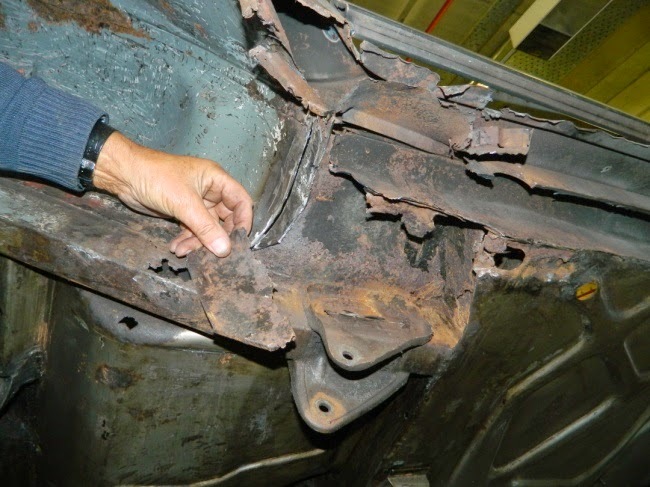 The repair work and strengthening to the engine support chassis beams is clearly shown here. Whilst there is still a lot of work to be done on the bodyshell real progress is now being made. 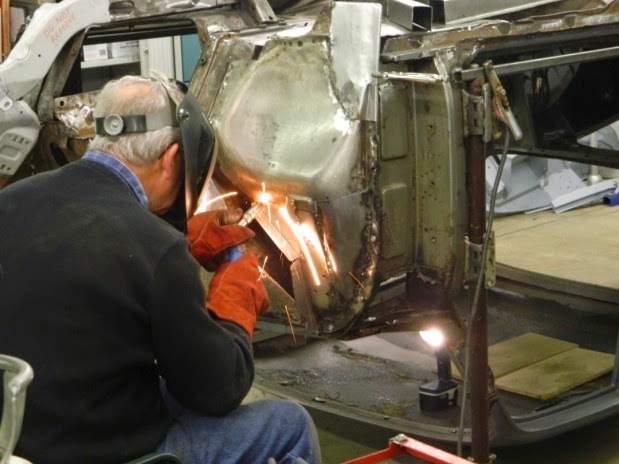 Most of the main fabrication work has been completed and soon the serious job of welding it all together can begin in earnest. 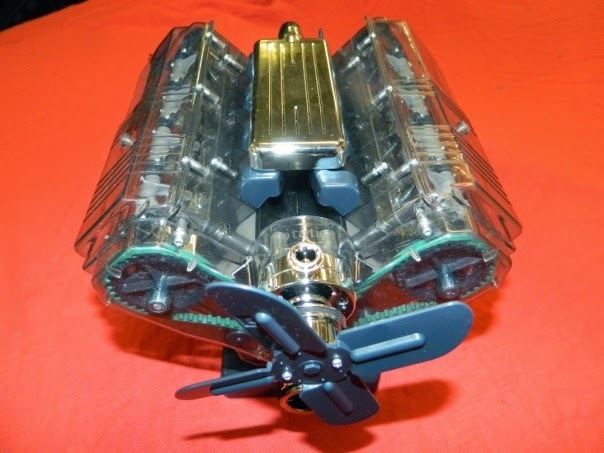 It's a simple 1570cc in-line 4 cylinder petrol engine with two overhead valves per cylinder and a single down draught Solex carburettor. 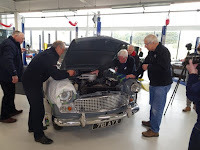 As explained in our first blog, despite a lot of effort, we couldn't get it to start as it was subsequently found that two valves were well and truly stuck. 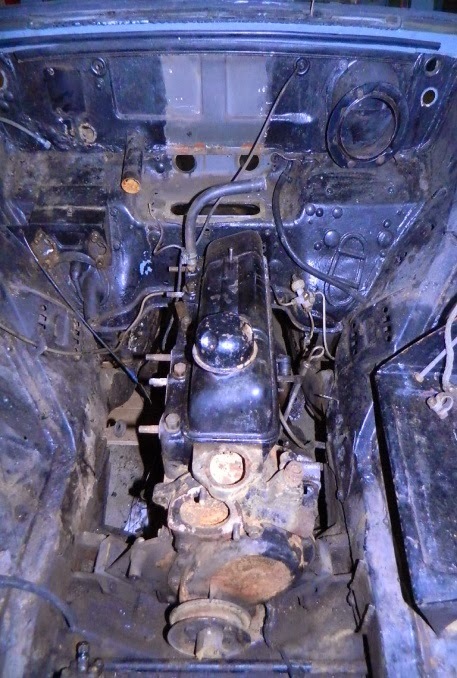 So after removing all the ancillary parts the engine was carefully lifted out of the car and then completely stripped down. 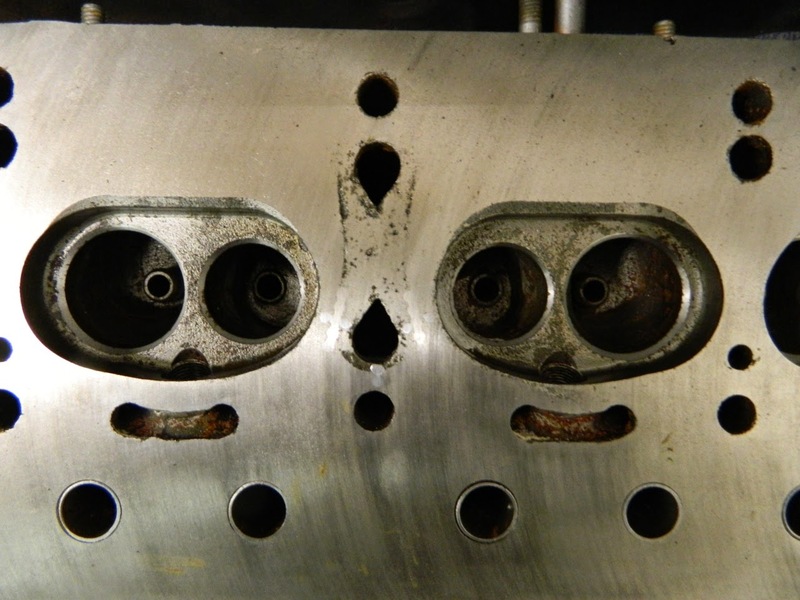 Initially, except for the stuck valves, all looked reasonably OK, but on much closer inspection it was noticed that the head was cracked. 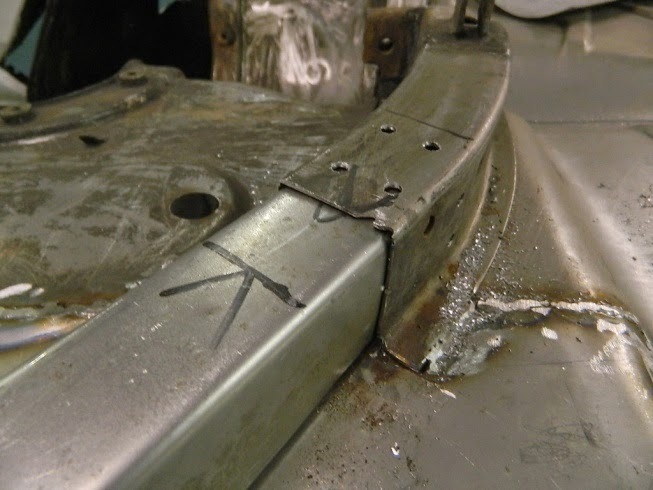 The view is that the crack can be welded and machined, or we could try and source a new head. 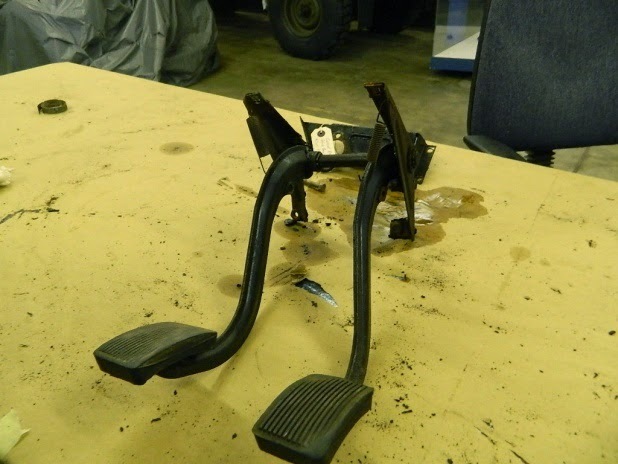 At the time of writing this a decision has yet to be made on which way to go. 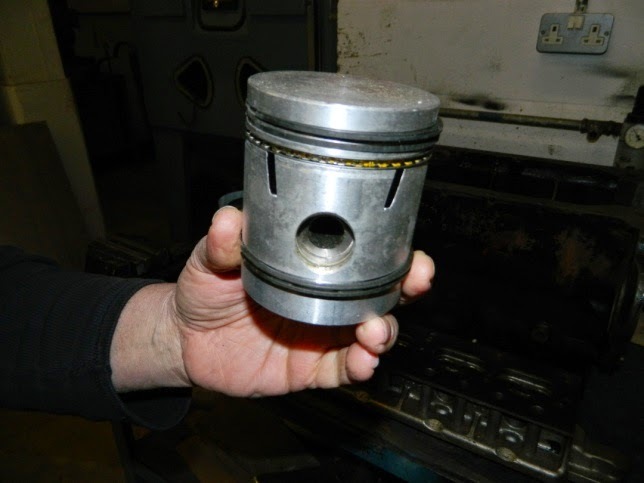 Another item, or items, we are trying to source are a set of piston rings. If anyone out there reading this can help us then we'd love to hear from you. 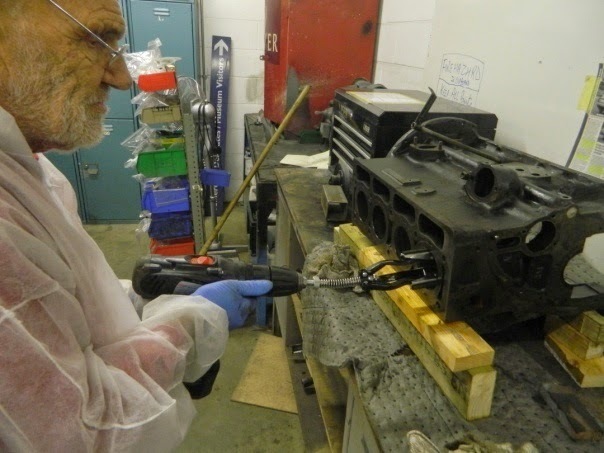 This can be done either via the Comments section at the bottom of the Blog or by giving our Volunteer Co-ordinator Sonja Dosanjh a call on 01926 645027. 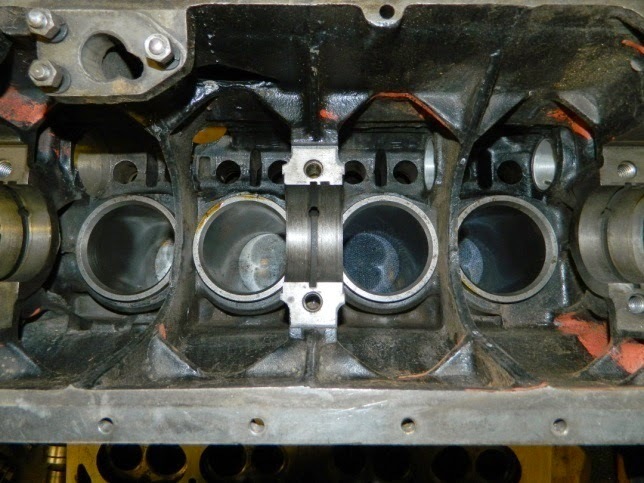 On a more positive note the bores have been honed and the big ends and main crankshaft have been inspected, cleaned and reassembled with new shells. 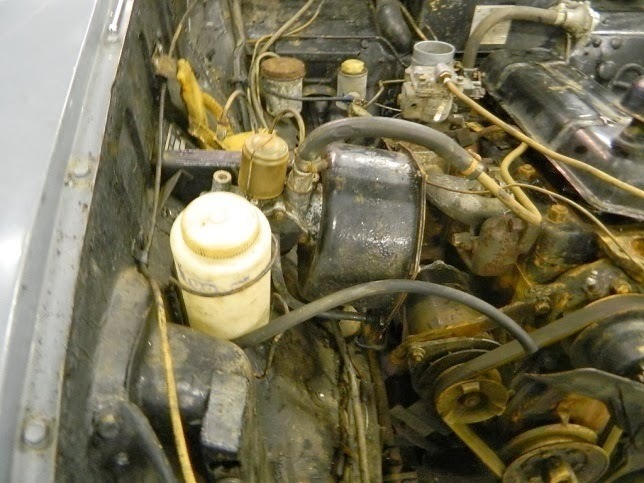 Obviously with an engine there are many ancillary parts, but generally apart for a good clean and overhaul, most seem to be fine and require little attention. 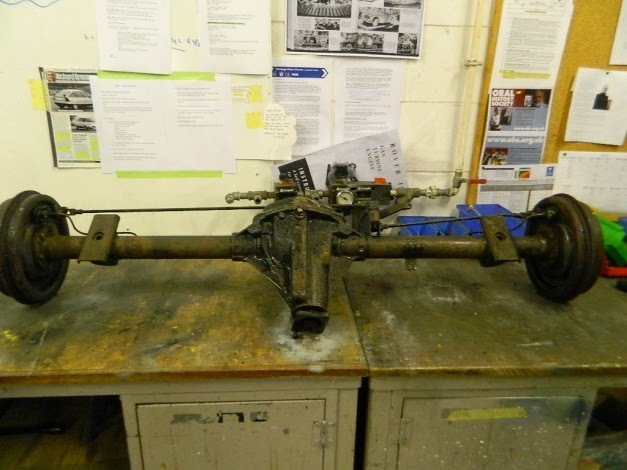 This blog has rather neglected our restoration of the Standard over recent weeks, mainly because progress has been slow. 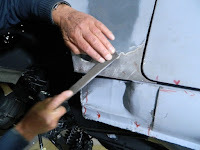 This is certainly not due to any lack of enthusiasm, but simply because the nature of the work required on the car has been very difficult and at times testing. 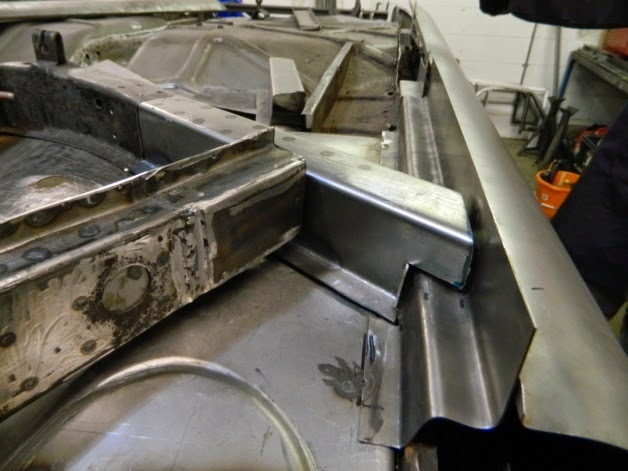 It should be remembered that the chassis/body of our Ensign model was in a very sorry state – beyond repair, some thought. 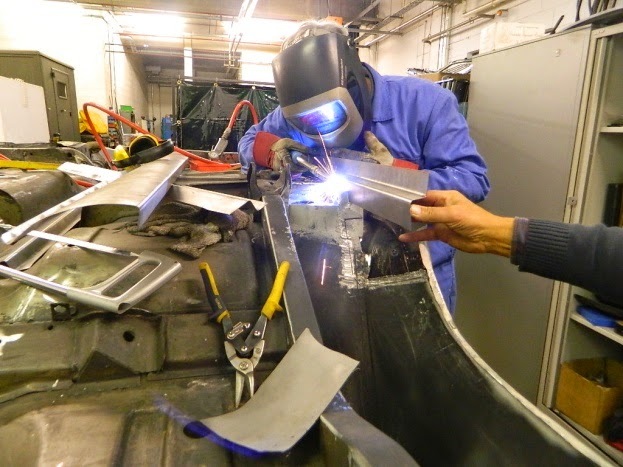 Added to this our collective experience and knowledge of metalwork and welding at such a demanding level was somewhat limited. 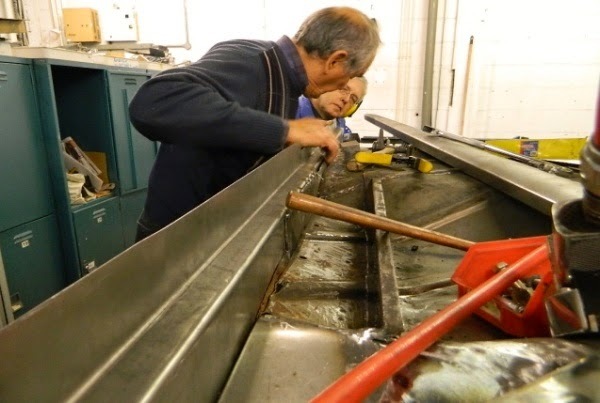 However, being thrown in at the deep end, is a challenge that the volunteers clearly love and whilst minor errors have been made, overall the quality of the repair work so far undertaken has been remarkable. 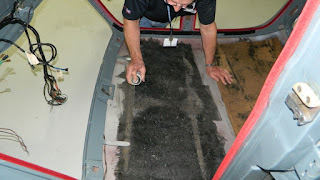 Pictures best illustrate the problems that were faced and no more so than the repair and rebuilding of the sills as shown above. The two sills themselves were the only items we were able to source prefabricated. Everything else had to be measured, cut, and then moulded or shaped. Another difficult task has been the repair in the area around the front bulkhead and the A-pillar. 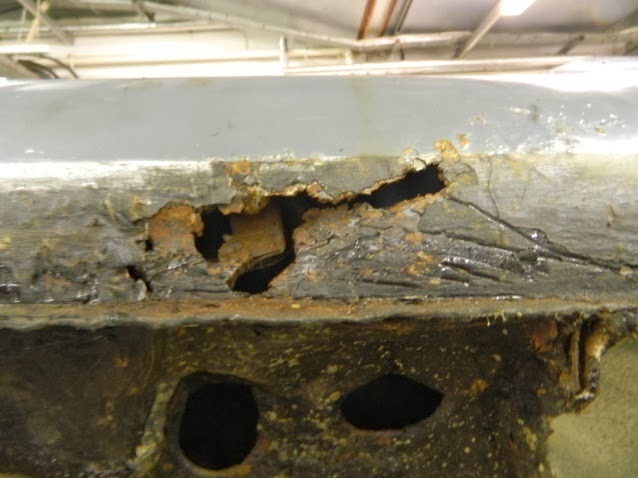 The first of the above photos illustrates the dire condition of this area and the second shows the work we've completed so far, to try and strengthen and repair this critical area. 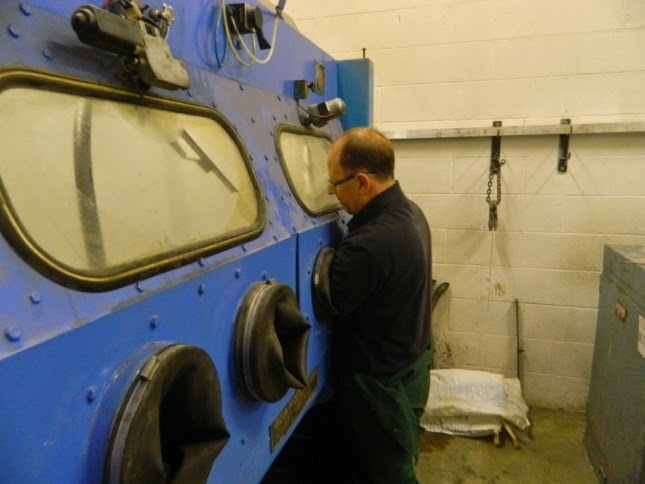 It is also worth pointing out that as we operate in a workshop that is within the confines of the Heritage Motor Centre we must of course obey all the Health & Safety that legislation now demands. This has required a lot more forethought, as we have to plan in advance to make sure all the correct paperwork and procedures are followed. 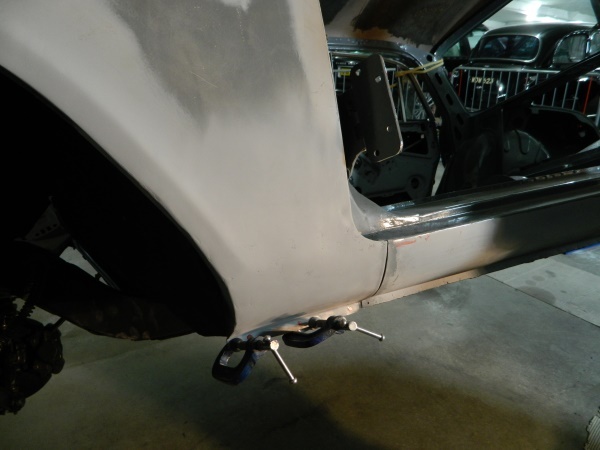 So, all the above gives you some idea as to why progress has been slow. 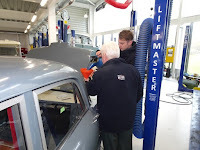 We've learnt a lot of new skills during this time and whilst there have been some frustrating times; there is now the feeling that we've turned a corner. 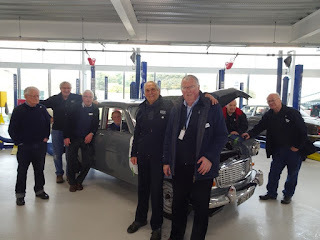 Next time we’ll introduce you to three other volunteers at the Heritage Motor Centre, that most of the regular volunteers didn't even know about. 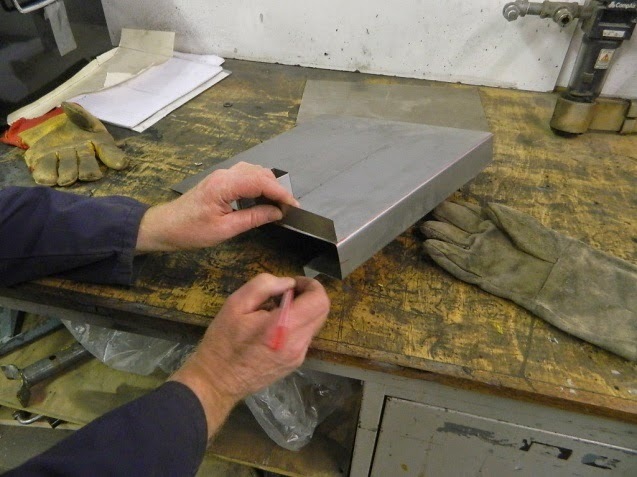 As was mentioned in a previous blog we've discovered that 'our' Ensign differs in a few minor ways; to the normal production model. 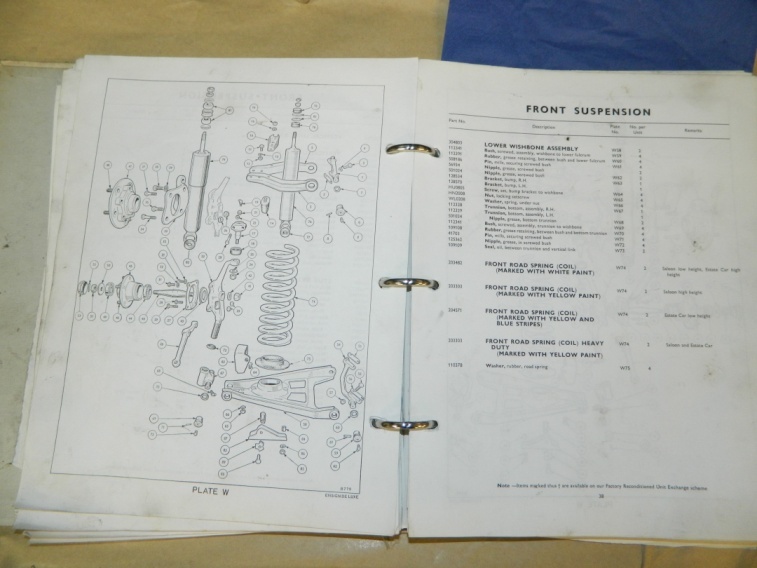 One example of this is the fitting of front disc brakes, the workings of which required some attention. 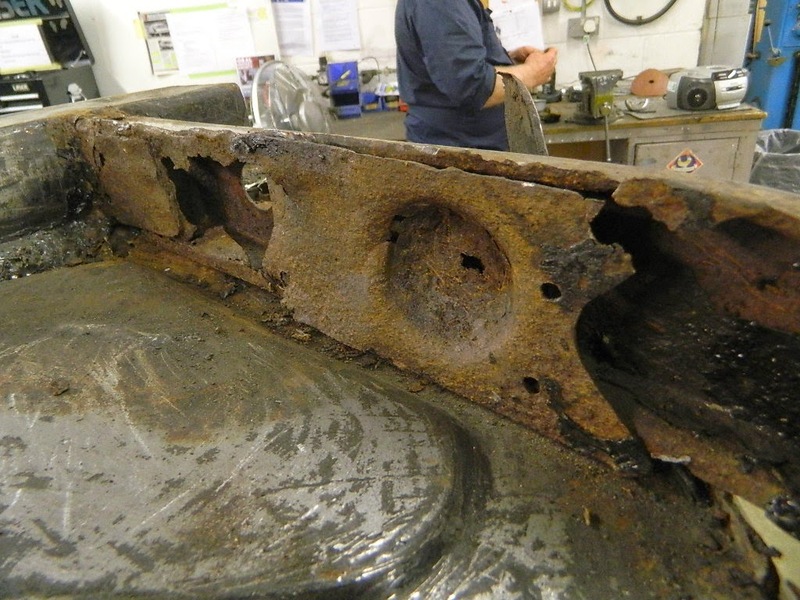 The condition of the discs was poor, so they had to be re-skimmed and after some consideration and in the interests of safety, a complete new brake servo unit was acquired and fitted. So, with the engine now fully installed, which on an initial test, appears to run OK, another milestone has been reached on this long and difficult project. 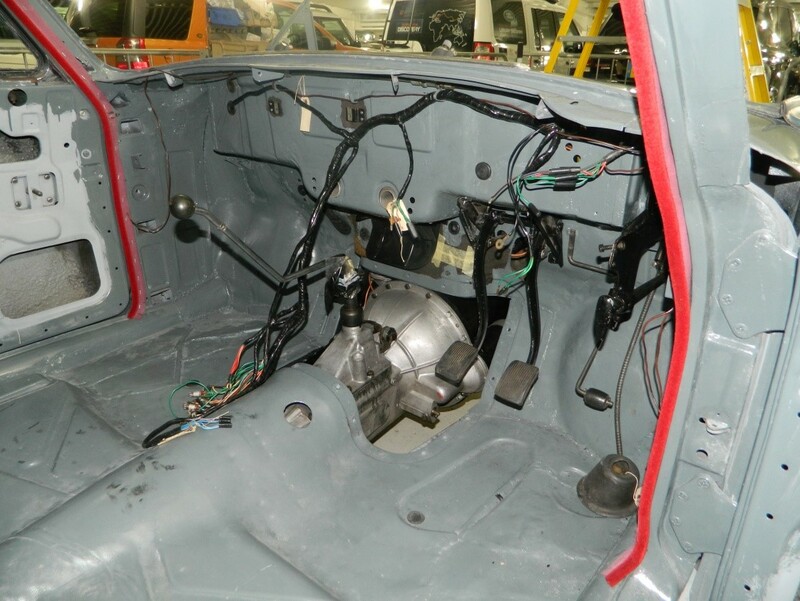 There’s still a lot of work to be done on fitting out the interior, but 2018 should see the Ensign on the road again. 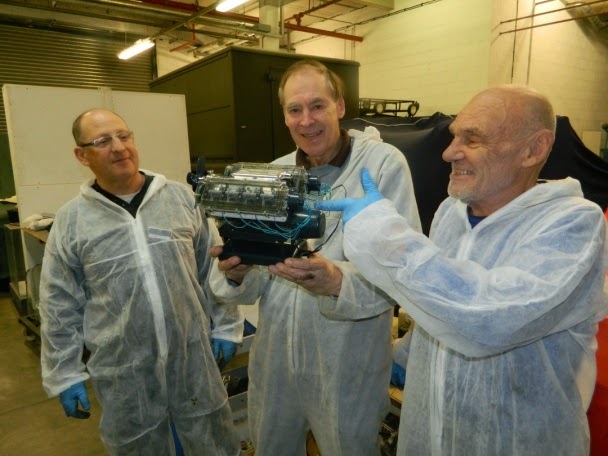 With this discovery, faces lit up and on the third attempt the engine fired up much to everyone’s relief. 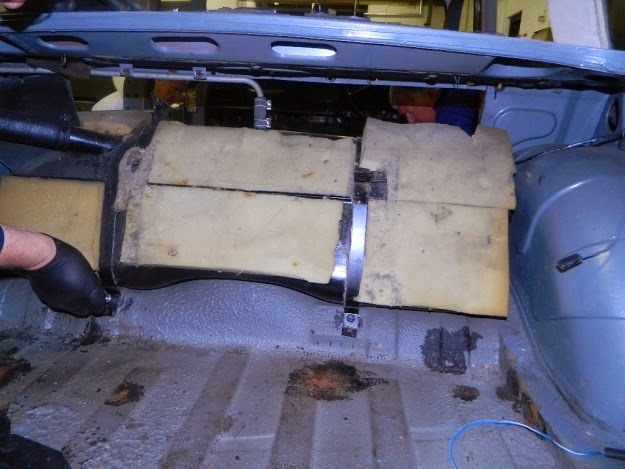 This procedure was repeated several times with the engine, initially at least, seeming to run very smoothly. 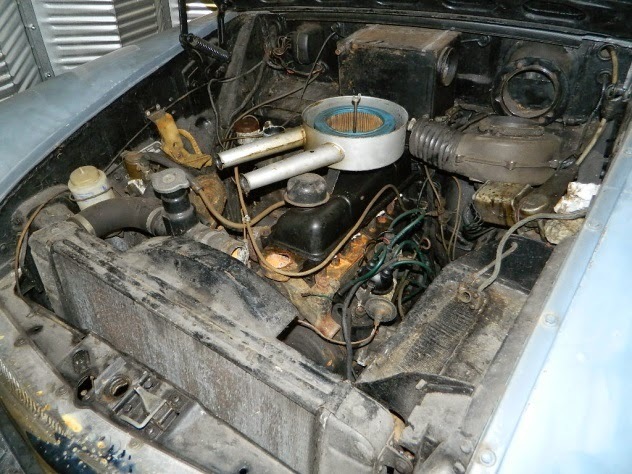 There were no fuel leaks and apart from a badly fitting radiator cap, no water leaks. 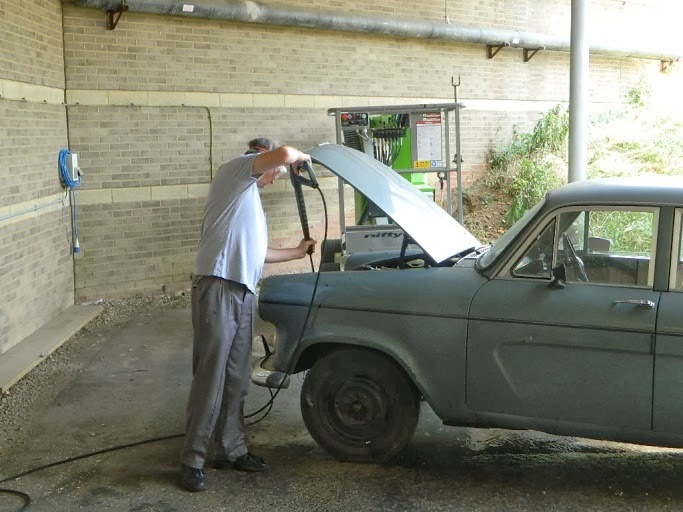 The temperature gauge appeared to be working OK, as was the heating system, but the fuel gauge is going to need some attention. 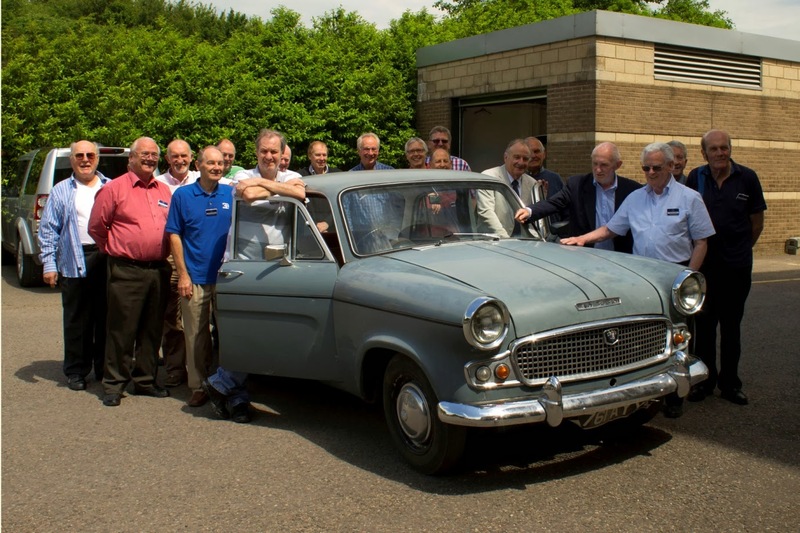 The Standard Ensign starting for the first time. 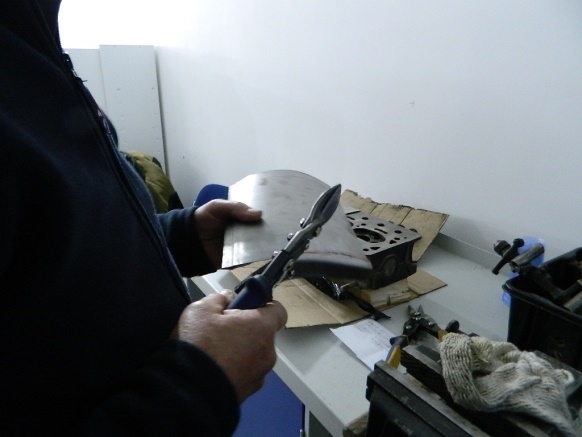 The final test of the day was to see if the gearbox and clutch were both OK and working. 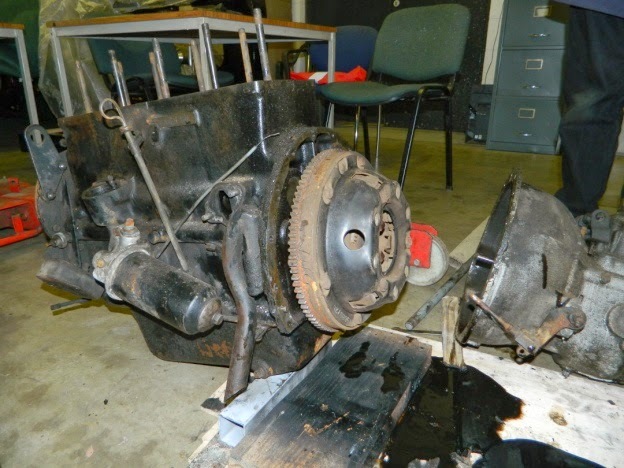 The gearbox, save for an oil change, is the only component which has not received any attention so far, so fingers were crossed. 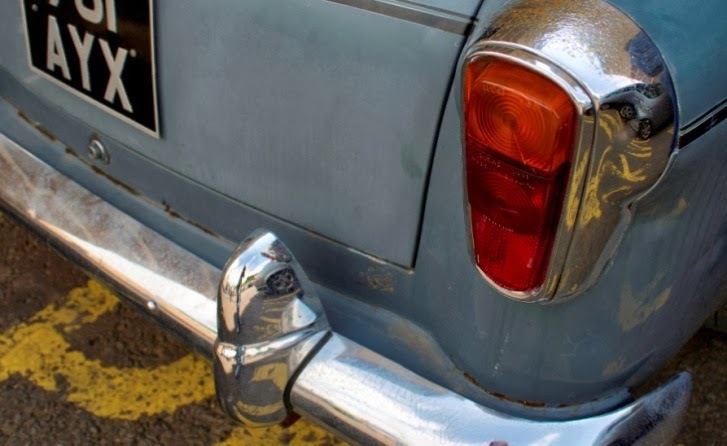 Although our time and space was limited, the car successfully propelled itself a short distance forwards and then backwards - again to the relief of everyone. 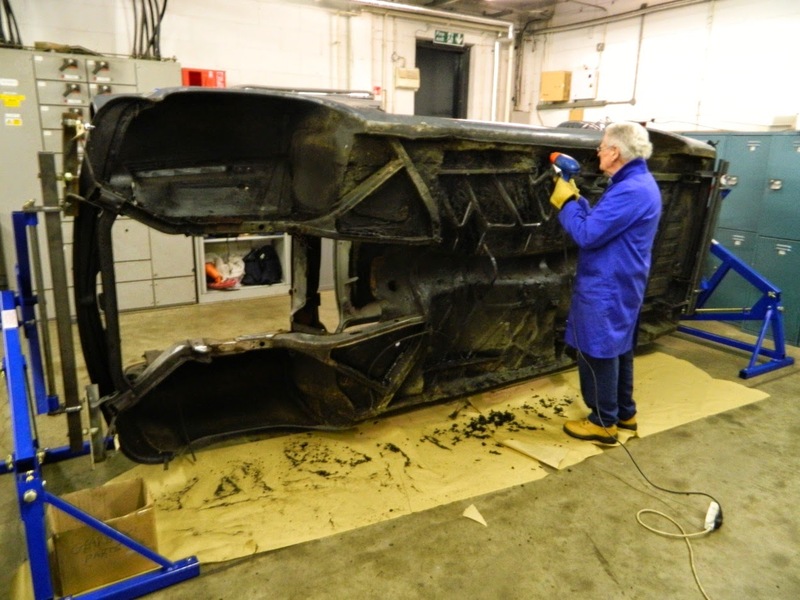 The car remains on display on the first floor of the Collections Centre and during most weekdays the restoration team can be seen working on it. They’re always happy to chat to any interested visitors and maybe help with any restoration and repair queries in general. The final piece in the interior jigsaw was the refurbishment and fitting of the seats. 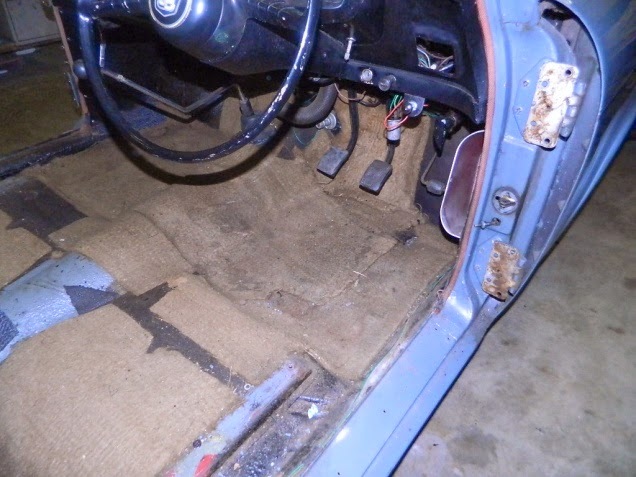 Although badly faded, except for a tear in the rear seat cushion, all were in a reasonable condition. 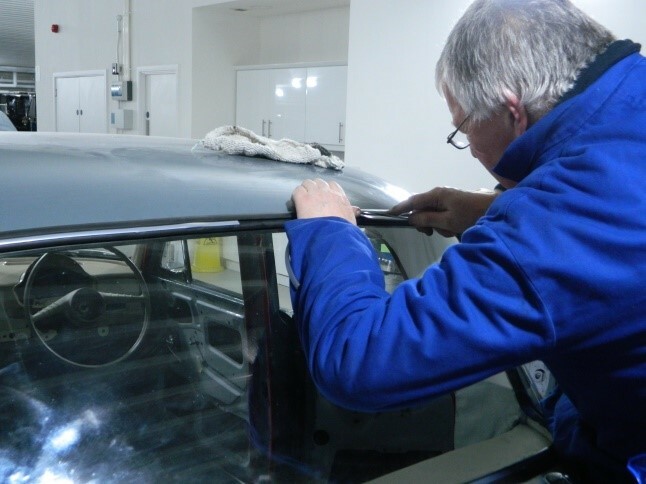 Following a thorough clean with an appropriate solvent and with the rear seat cushion repaired, all the seats were sprayed with special seat paint. 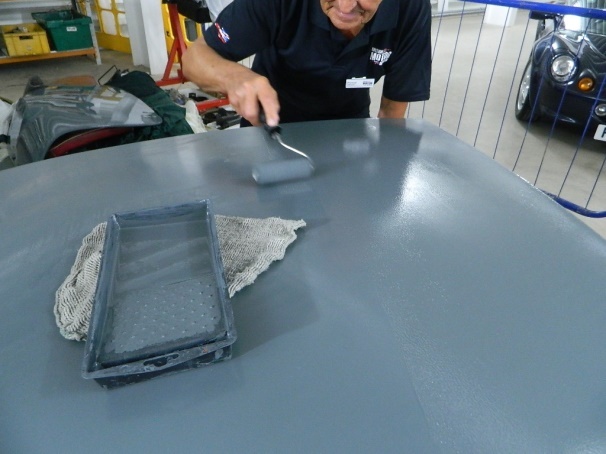 Several coats, which amounted to five tins, were applied and everyone agreed the result was excellent. 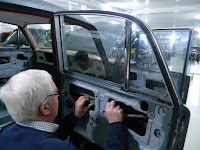 With the interior now virtually completed, attention returned to the engine, following its successful start-up and gentle running in the Museum’s workshop. 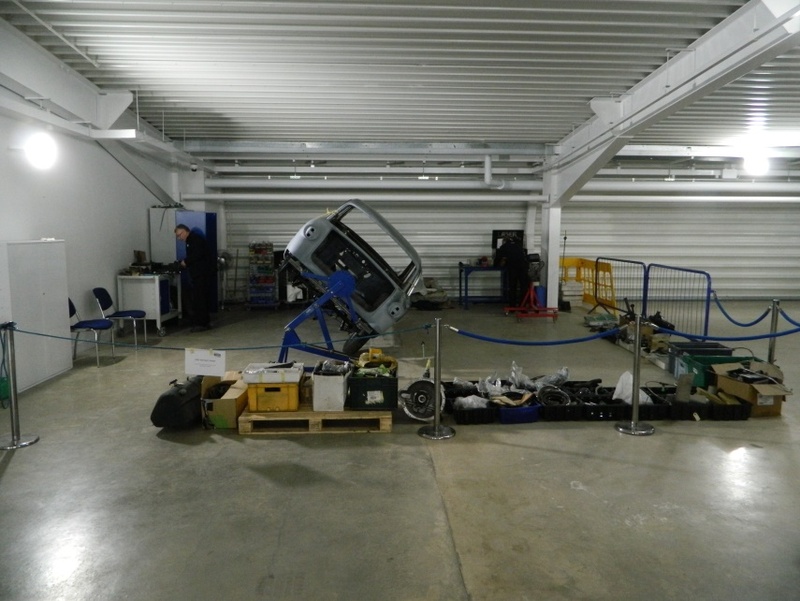 We’re fortunate that with large car parks and a perimeter road at the Museum site, we have our own private road test facility. 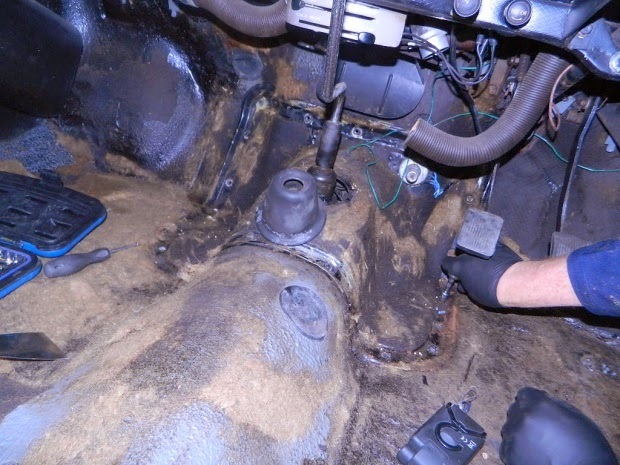 Whilst the engine continued to run well on its first short trips, it quickly became evident that there were both oil and water leaks that needed investigation and attention. 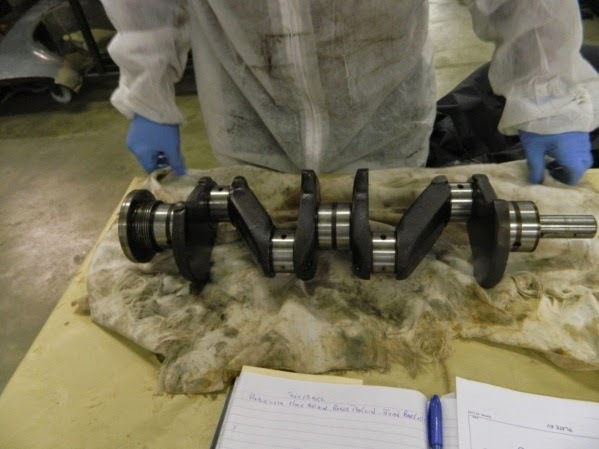 A thorough examination on the workshop ramps revealed the main oil leak was coming from the area of the rear crankshaft. 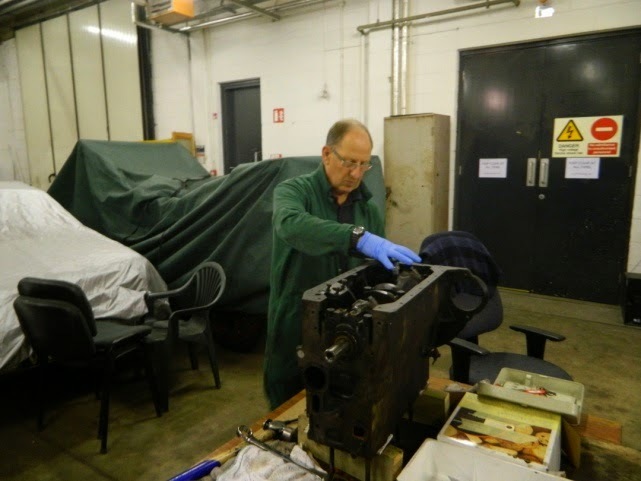 So, back at its home in the Collections Centre, work began on finding the cause, with removal of the clutch assembly and flywheel. 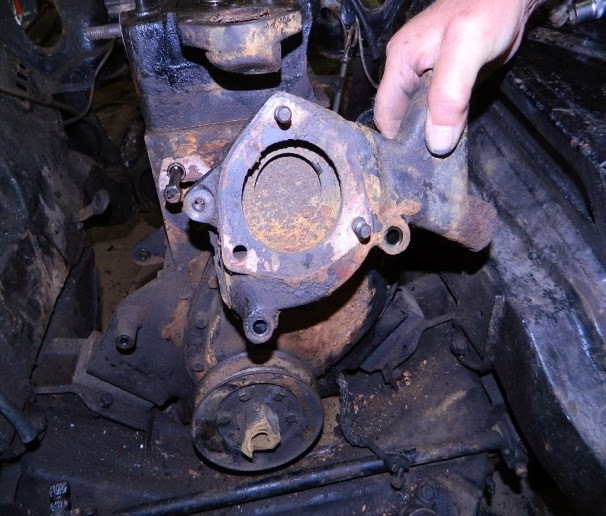 A loose internal core plug at the rear of the crankshaft was found and oil had clearly leaked into the bellhousing. 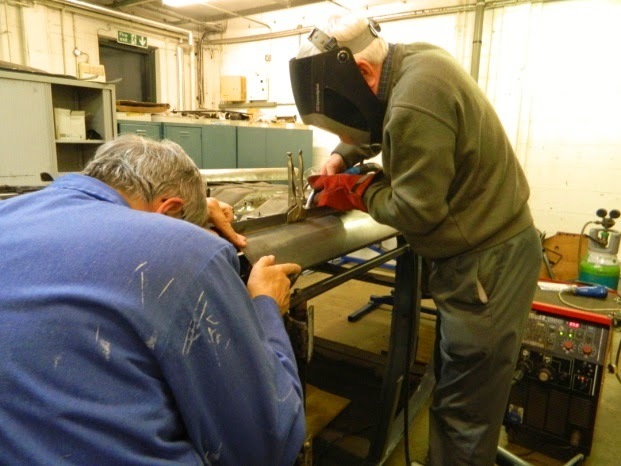 More runs around the site were completed with follow up checks and adjustments on the workshop ramps. When the volunteers were satisfied that the general operation of the car was OK it was handed over to the Museum’s workshop manager for a thorough check. 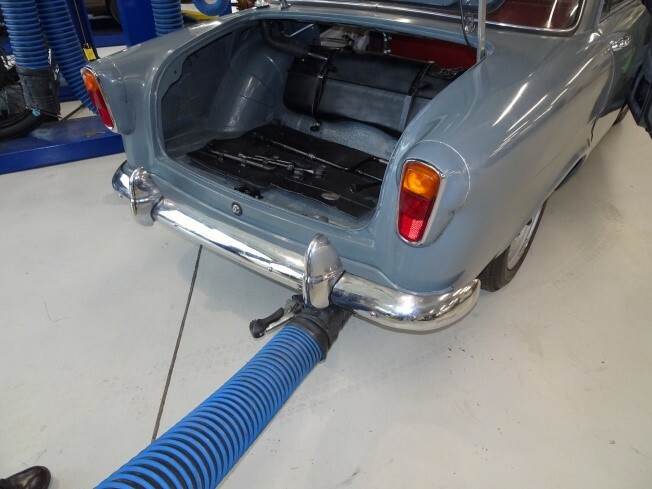 A snagging list was then prepared of items that needed attention before the car could be sent for its MOT test. 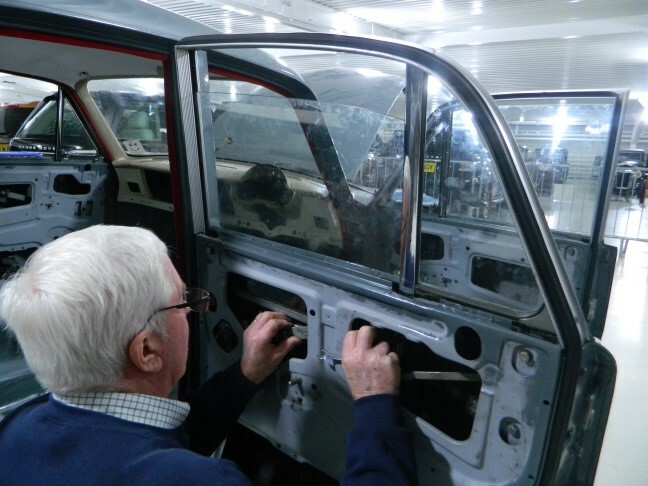 Nothing serious was discovered and after several weeks spent adjusting, replacing and repairing minor items the Ensign passed its test on 4th February 2019. 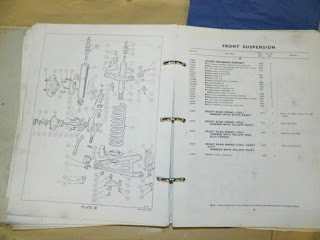 The above photo shows the fourth and final A4 logbook that was completed by the volunteers over five and a half years working on the Ensign, plus its MOT certificate. 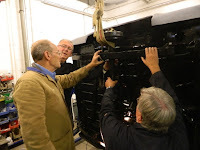 The finished car is pictured on one of its several trips in and out of the Museum’s workshops. 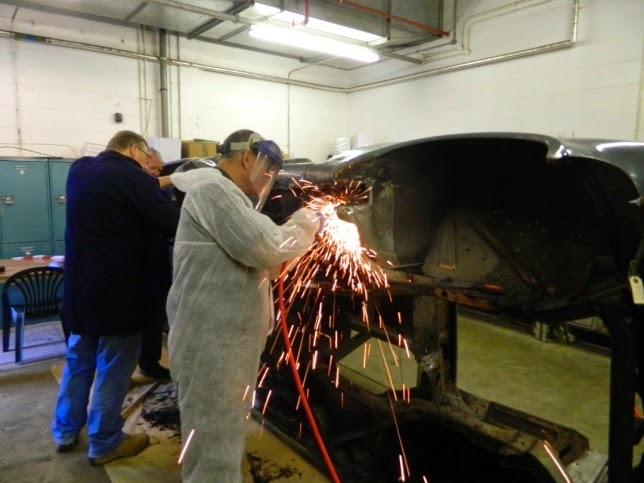 During the next few weeks the car will receive a bit more tender loving care before it is formally handed back to the Museum for display and trips to local shows and events which the volunteers attend.